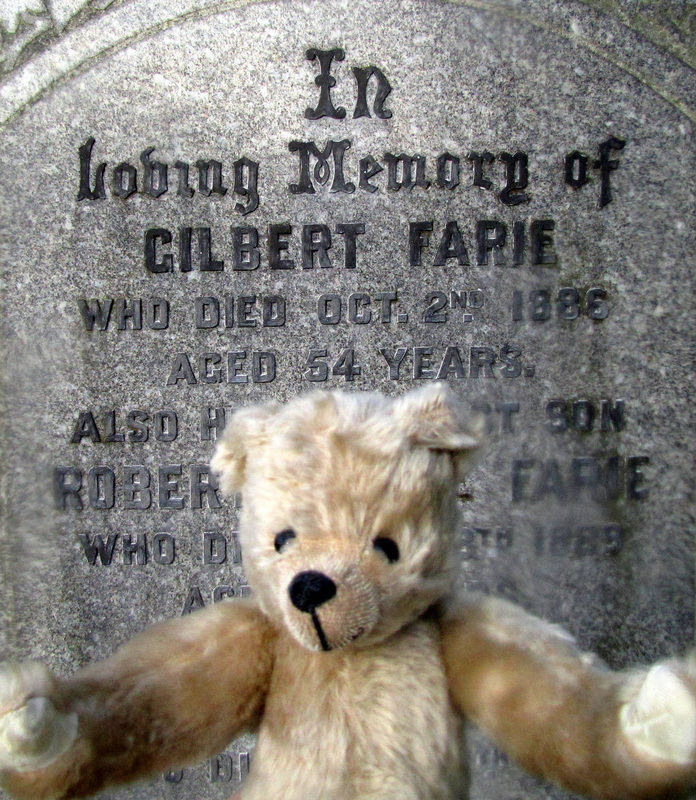 Gilbert Farie, (pronounced fairy) you will not have heard of, for he is a forgotten village Pharmacist who practiced back in Victorian days. Gilbert Farie was the dwarf pharmacist, hunched, red cheeked and monocular in vision, who each day dispensed from his pharmacy the cough medication for the boy who was Robert Louis Stevenson. Gilbert Farie could sell anything, and literally did. 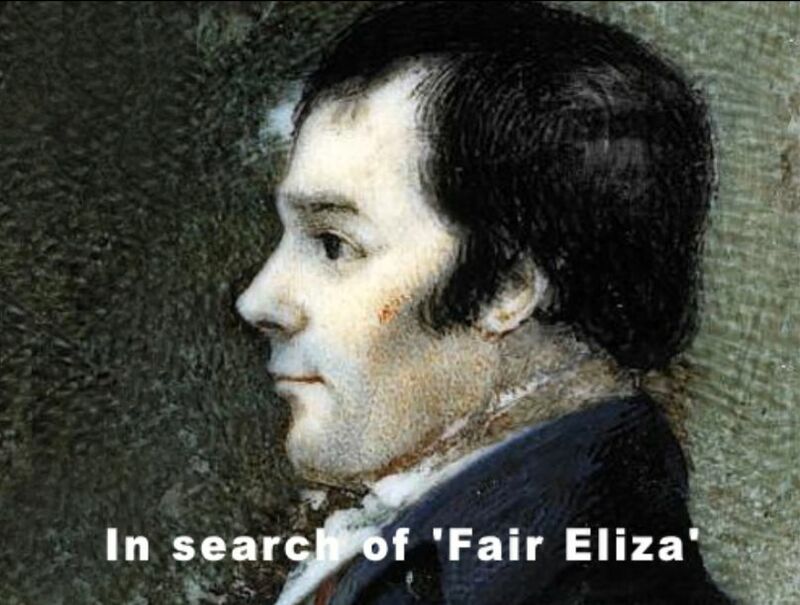 He monopolized the Spa town of Bridge of Allan, made a fortune and married an heiress. He was widely unpopular as his only pursuit was of self advancement. No wonder he crept into the nightmares of young Robert Louis Stevenson. 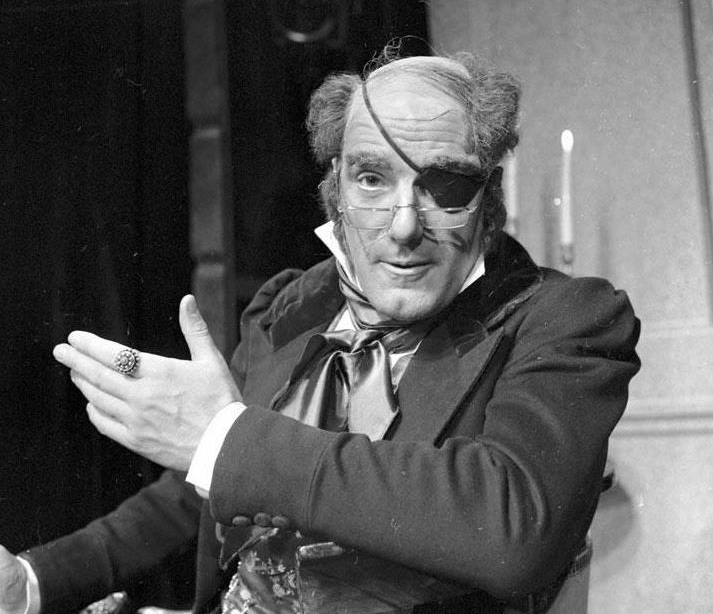 By now, you will have gathered, that Gilbert Farie was the counter of Dr Jekyll. Yes, Gilbert Farie was Mr Hyde. Our family shares no DNA, not even one helical twist with Gilbert Farie. You may conclude then that the following chapter is a forensic anomaly amidst a collection of family stories. Today, Gilbert Farie’s pharmacy still runs, and with an interior that is largely unchanged, still dispenses to our family. Through Gilbert Farie’s window it is possible to capture the passage of time and perhaps also the narratives collected here. It is of course a glimpse captured through one window only. This chapter will stumble into a philosophical world of mental suffering. 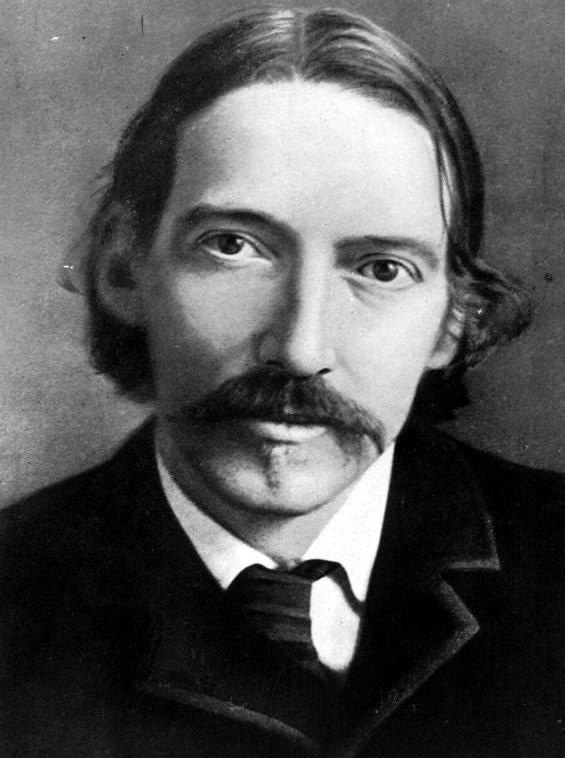 To give some sure-footedness to such faltering steps I have taken liberty in employing the writings of Robert Louis Stevenson. In my revisits to Gilbert Farie’s pharmacy I will offer ten reconsiderations: each carried by the title of one of the works of Robert Louis Stevenson. A couple of general reminders should be made. First you will recall that my older sister is called Catriona and she has suffered more than her fair share of mental suffering. The second reminder is that Gilbert Farie (the pharmacist) lived with Dr John Stewart Rutherfoord our first village doctor (and my forebear of many generations back) one of the resurrectionists that provided bodies in Edinburgh for the anatomist Dr Robert Knox. I offer here ten considerations made in my revisits to the pharmacy that once belonged to Gilbert Farie. A pharmacy still busy dispensing to our village. Kidnapped –asks if the humanities have capitulated to our biology? Treasure island – where we find reason not gold. My earliest memory is the vantage I had from my princess pram: peering out from the merimo hood I could see above the Buckstone pharmacy a large gold pot pulled-in at the waist. Just above was the gold handle of a golden pestle for a golden mortar. For the last 40 years I have tried to spot such surviving symbols of the alchemist. Certainly they are now rare unlike the need for remedies which are not. In a way the golden mortar and pestle have come to represent to me misunderstanding. You see I thought the golden pot was a container of sweeties and I was baffled why it was kept well out of my reach! Over time I have understood that this pram journey was the start of an exploration of the world in which I found myself. It took Gilbert Farie to reveal to me what was important and what was not. 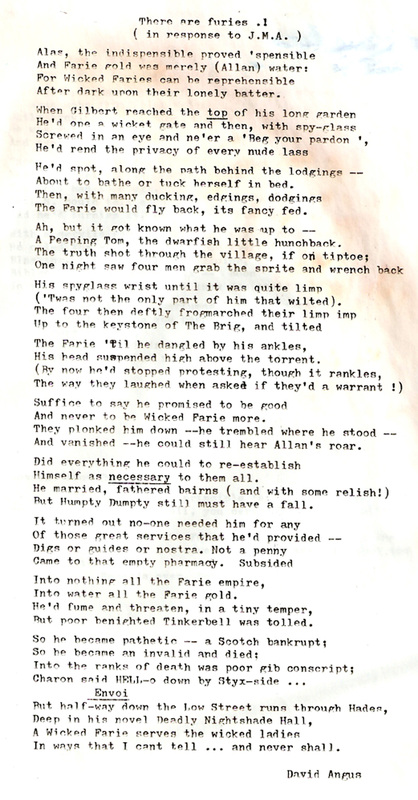 One of our villagers, now deceased, wrote a poem about Gilbert Farie: he called it ‘There are furies’. As I shall explain, my fury is against Jekyll and Hyde thinking: polarised thinking that reaches to silly extreme. There are so many examples, and I shall explore some of them below. C.P. Snow in his 1959 Rede Lecture at The University of Cambridge maintained that there was an unhealthy divide between the humanities and the sciences. Subsequently published as The Two Cultures and The Scientific Revolution Snow later commented ‘‘if you hit a nerve hard and get an instantaneous response from a large number of people in the world, then you must have said what a lot of people have been thinking.’’ For medicine this divide has had consequences as this chapter shall reveal. In more recent times Leon Eisenberg has suggested that what has ‘hampered progress is too narrow a view of the sciences’ relevant to medicine. The concepts and methods of the social sciences he argued must be integrated into medical education if doctors are to be enabled to respond effectively to illness as a human experience. I am reminded here of the Charles Dickens narrative, A Dinner at Poplar Walk. In this work both cousins are absurd but neither is wholly unsympathetic, and the drama bites, without villain or hero. Order and muddle are set against each other. This also returns to a concern that will probably always needs reconsideration: the classification of mental suffering. I am as guilty as any other of what I term as ‘Jekyll and Hyde thinking’. Another doctor has helped me here and that is Professor Michael Rutter who recently suggested that we remember: “Progress in science – clinical science and basic science – has to come from questioning the given wisdom of the day and doing so in a style that builds constructively to a better understanding.” It is helpful here to return to philosophy, for in terms of a current medical understanding and the over-arching paradigm that is evidence-base, going at least by debates in all the major journals, we are beginning to realise that evidence base is necessary to progress our understanding but in itself it is not sufficient. What should be obvious may not be and this returns us to Jekyll and Hyde thinking. With technological advance, it is understandable why mankind has chosen to view life through the paradigm of illness, when actually what we seek is health. Wholesome humanity must not today approach this back to front, or the result will bring harm. Extreme medicalisation runs the risk of causing harm: are one in four of us really mentally ill? Where do our definitions of illness stop? Where does ageing fit in? Might there be unforeseen consequences? And then, and it is usually the last consideration, what about stigma? These are but a few questions brought about by extreme thinking. Examples of Jekyll and Hyde thinking abound, such as the idea underlying modern neuroscience, that nerve impulses can journey towards a place where they become consciousness. I am with Dr Raymond Tallis that such is plain ‘barmy.’ Whilst I am less skeptical of neuroscience than Raymond Tallis, I agree with him in the frankly BOLD conclusions made from voxel colours on functional MRI experimentations: fMRI that separates brain from both the body and the world that the body lives in. There are good reasons for doubting one of the assumptions on which many fMRI studies are based: that neural mechanisms are always and everywhere sufficient for cognition. Mark Sprevak suggests that in the case of the mechanisms underlying psychiatric disorders, this assumption should be doubted. Mark Sprevak does not dispute that a malfunctioning neural mechanism is likely to be a necessary component of a psychiatric disorder. His question is whether a story only in terms of these neural mechanisms is sufficient to explain the mechanism of a psychiatric disorder. 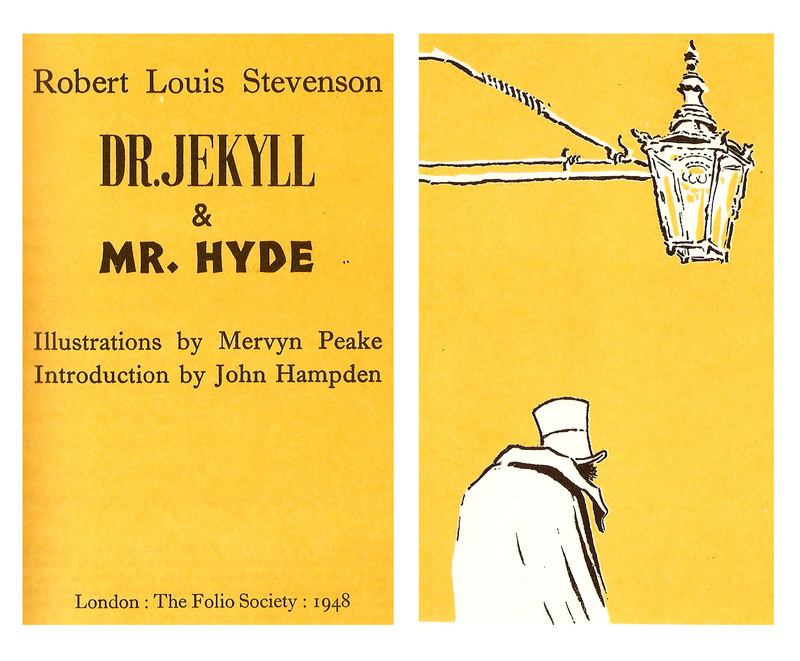 One dramatist returns us directly to Jekyll and Hyde thinking and that is Stephen Poliakoff. 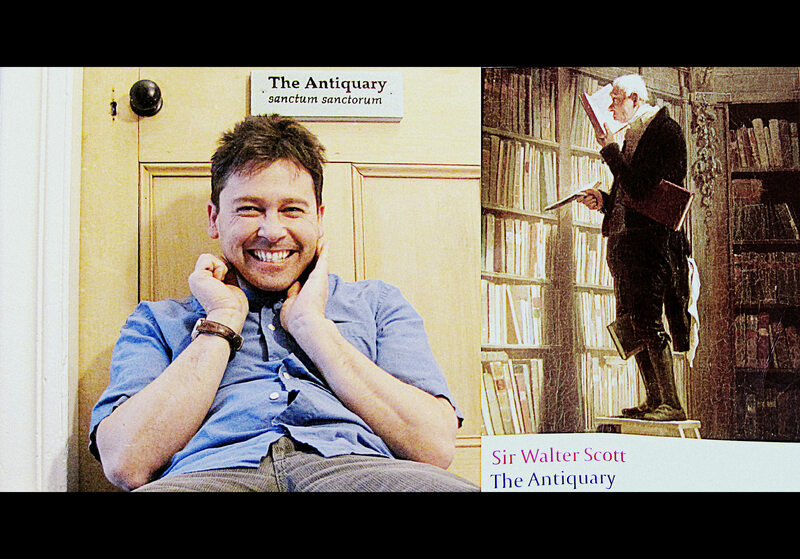 He is a director who has acclaim, yet who has also been assailed for his obsession with the past. I must be honest; I feel an affinity with Poliakoff that perhaps rules out proper scrutiny. I was first brought to his work through Sian, my wife, after she recorded his 1999 production ‘Shooting the Past.’ I was captivated by the imagery, music and surreal characterization. The oddball archivist and custodian, Oswald, was metaphorical of my need to find meaning in the past. However, in subsequent productions, Poliakoff was to stick rigidly to a world of grand pretension with characters that were no longer surreal but unreal. However, it seems to me, Poliakoff should be charged with inconsistency rather than wholesale rebuke. Indeed, his critics are as badly polarised as his doe-eyed following. I would urge you to watch Poliakoff’s 2003 production ‘The Lost Prince,’ telling the heartbreaking story of the ‘monster boy’ Prince John. Through the detached eyes of the autistic and epileptic Prince, we see infact that it is the preposterous world around him that is the Monster. The vantage of the boy Prince, looking out from behind a half-opened door, reminds us of a Jekyll and Hyde world of divide. 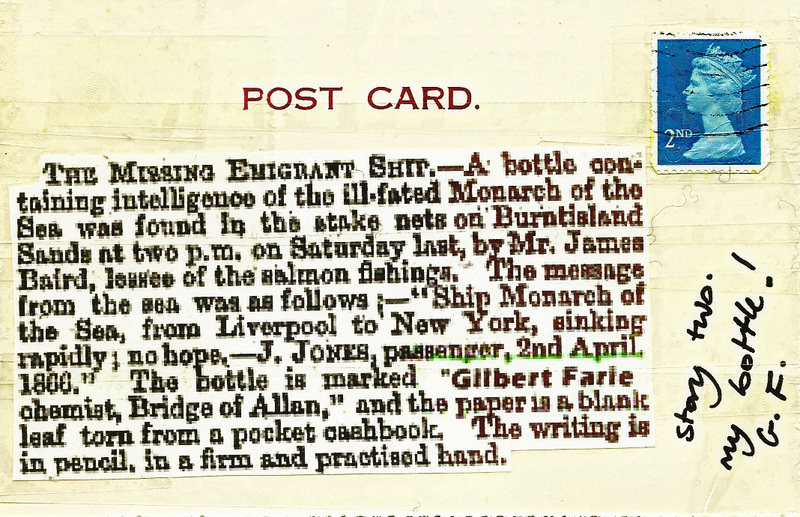 A bottle containing intelligence of the ill-fated Monarch of the Sea was found in the stake-nets on Burntisland Sands at two p.m. on Saturday last by Mr. James Baird, lessee of the salmon fishings. The message from the sea was as follows: “Ship Monarch of the Sea, from Liverpool to New York, sinking rapidly; no hope. – J.Jones, passenger, 2nd April, 1866.” The bottle is marked “Gilbert Farie, chemist, Bridge of Allan,” and the paper is a blank leaf torn from a pocket cash-book. The writing is in pencil, in a firm and practised hand. Recently I asked my wife Sian why I carried some anger towards the profession that I love and am honoured to be part of. I knew the answer but I was struggling to articulate it. The answer was Catriona, my older sister. A professional colleague once told me that in talking about my sister my words ‘were wasted’ for doctors find ‘heart-on-sleeve’ words ‘uncomfortable’ and ‘inappropriate’ from a fellow ‘professional’.. So in this section I am not going to talk about my sister Catriona but you may get the impression that I am! 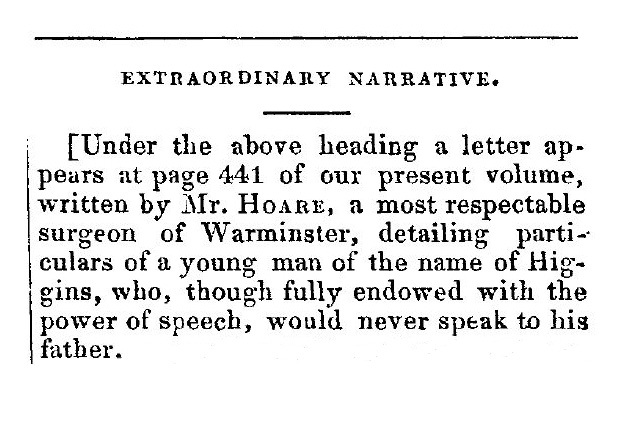 It was by magpie chance that I found a 150 year old news report about an extraordinary narrative where a young man of the name of Higgins, who, though ‘fully endowed with the power of speech’, would never speak to his father. I mention this as it is not as extraordinary as it sounds and because it reminds me that families function in the land and the hinterland of interactions. Dr Hoare, the ‘respectable surgeon’ looked hard at Higgins but was dumfounded as no medical cause could he find for the child’s specific aphasia. One conclusion, though obviously whiggish, may be made, is that perhaps Dr Hoare might have better spent some time looking at the formative relationships behind Higgins? There is a writer today that has written on the subject of how we accommodate ourselves in the family. Dr Alan Rappoport’s paper is on what he calls ‘co-narcissism’ and it has, in my experience, bearing on many who grow into adulthood tussling to maintain mental health. Here we consider the world the adult-to-be has lived in: for example with parents who struggles to ‘see’ or ‘feel’ beyond themselves and as a result their child works harder to please, to defer opinion, and adjusts to fear being selfish or in fear of being assertive. Occasionally a narcissistic parent battles with a narcissistic child: the resulting tug-of-war can pull one or other over into a muddy pool of cess. Here we have Barclay’s elephant (see below). When I employ the elephant in my films generally it is to suggest through symbolism what science can miss. Here I am generally talking about the world round about us, our interactions with one another and the passage of time that perhaps narrative gets closest to representing? The elephant above was gifted to Dr Knox’s Anatomy museum thanks to Dr Barclay. However with Knox’s ‘notoriety’ the elephant disappeared. In our case the notoriety might be reductionist medical understanding. 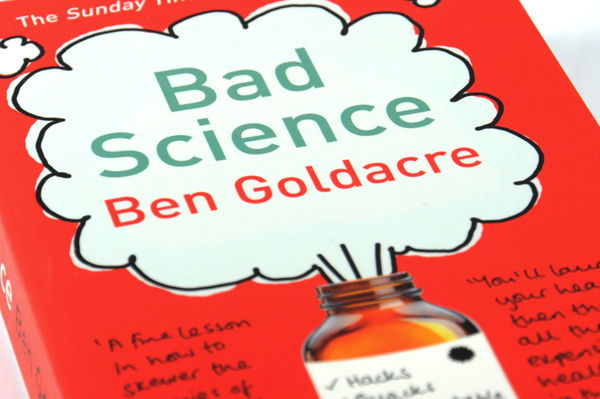 In 2008, Dr Ben Goldacre published ‘Bad Science’ and it has since become a bestseller. Two chapters in this book are worth considering when it comes to Catriona, my sister whom I am told by fellow professionals I should not talk about amongst them. The first is ‘How the media promotes the public misunderstanding of science.’ We are used to journalism that reduces the horrid reality of mental suffering, yet perhaps it is also true that many of us, when in trouble, seek simplified diagnostic understandings. There is a cost here (and I am not here referring to stigma) and that is by reducing too much of suffering to a diagnostic ‘entity’ risks reducing the very understanding of that suffering. Here I do think of my sister Catriona. The chapter in Bad Science that resonates here is where Ben Goldacre suggests reasons ‘why clever people believe stupid things.’ In terms of evidence-based research he argues that we: ‘tend to seek out confirmatory information on any given hypothesis.’ My sister rests in all this, and whilst I refuse to generalize her case I cannot help wondering if we seriously wish to ‘scientifically’ understand Catriona and her mental suffering that we need to include her journey from childhood and the world she has lived in. (3) Kidnapped: asks if the humanities have capitulated to our biology? I would say that they have, at least through my window. I try hard to resist ‘Jekyll and Hyde thinking’. As a graduate of Science, and as a graduate of Art, I refuse to be disciplined by either! In July 1856 Mr Snape, the Medical Superintendent for Surrey Lunatic Asylum was prosecuted for the alleged manslaughter of a patient named Daniel Dolly. I see metaphor here. When considering Professor Snape, thanks to Harry Potter, we are today more familiar with the master of Hogwarts portrayed as an embodiment of all that is sinister, yet ultimately revealed special for his humanity. This year is the bicentenary of the birth of Charles Dickens. 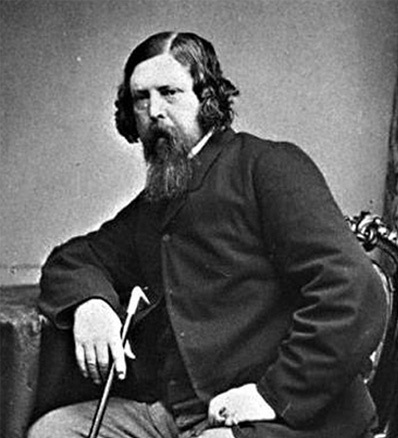 It is worth considering what shaped his humanitarianism: “John Forster, who was the first to be told the whole story more than twenty years later, believed that it had given Dickens his exceptional determination and energy to ride over obstacles, with ‘a sense that everything was possible to the will that would make it so’, and also a cold, fierce aggression that burst out occasionally, quite at odds with his normal generosity and warmth” “. 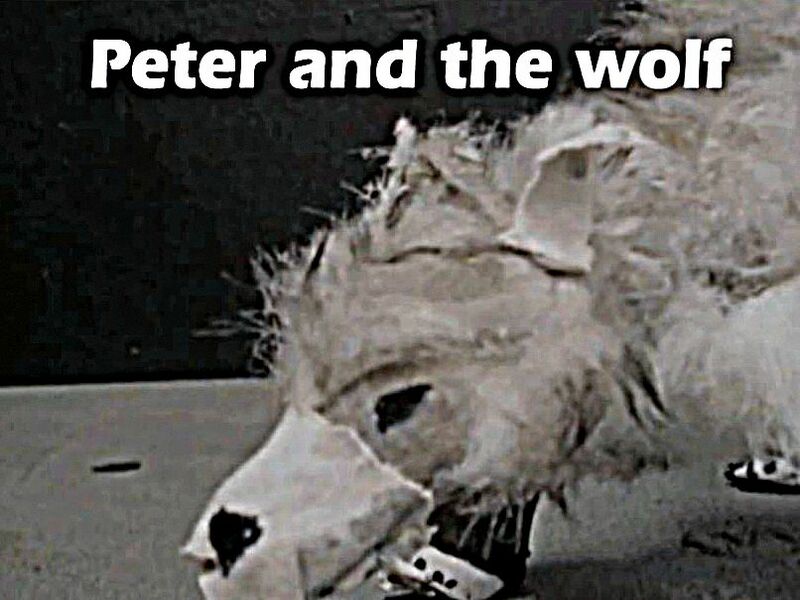 . . but if the experience did some damage it strengthened his character too.” It is hard not to identify with Pip in Great Expectations, for he survived so many childhood adversities and was damaged; yet despite this he managed to do good to those around him. But Pip was not glorified and we gradually appreciate that the best we can hope for him is to end his days with a measure of self-knowledge. Perhaps, in this way, Great Expectations is the truest of Charles Dickens novels? Pessimistic biologism dovetails with other intellectual trends and it should be no wonder that this is the rallying call of many of today’s philosophers. Here I am with Raymond Tallis who has stated: “Fortunately, we don’t have to be either dishonest or muddled or self deceived to challenge the biologistic picture of humanity. Our questioning must begin with a critical look at the assumption that consciousness is identical with brain activity so that observations made by neuroscientists are casting light on the very nature of the human mind.” It occurs to me that there are so many ways of putting this, none of which deny our biological basis. A major feature of Western culture, and still gathering pace, has been how medicalised ways of thinking have come to dominate explanations for the vicissitudes of life, and the vocabulary of distress. The concept of a person now emphasises not resilience but vulnerability. This is a momentous shift that has no biological basis. In the British Journal of Psychiatry of summer 1993, R.H. Cawley insisted that Psychiatry is ‘More Than a Science’: “I propose that psychiatry is an applied science and in addition something more. I believe the advances in its scientific content, over the last four decades, may have dazzled us into blindness, or at least made us inarticulate, about the dimension which does not fall within the boundaries of science. If that is true, the future of the subject is threatened by the neglect of one side of its foundations.” I am with those who say that history has revealed Dr Cawley to have had valid concern. Let us reaffirm: this section asks if the humanities have capitulated to biology? Today we need only look at the deliberations over the latest edition of the Diagnostic and Statistical Manual of Mental Disorders (DSM). The fifth edition of this has been much delayed and the reasons for this will be explored. Let us stop and consider: “a disease of the brain affecting the mind”: can such a classification be valid? At the time it was ridiculed by several of the leading psychiatrists of the day and in particular by Dr James Crichton-Browne. 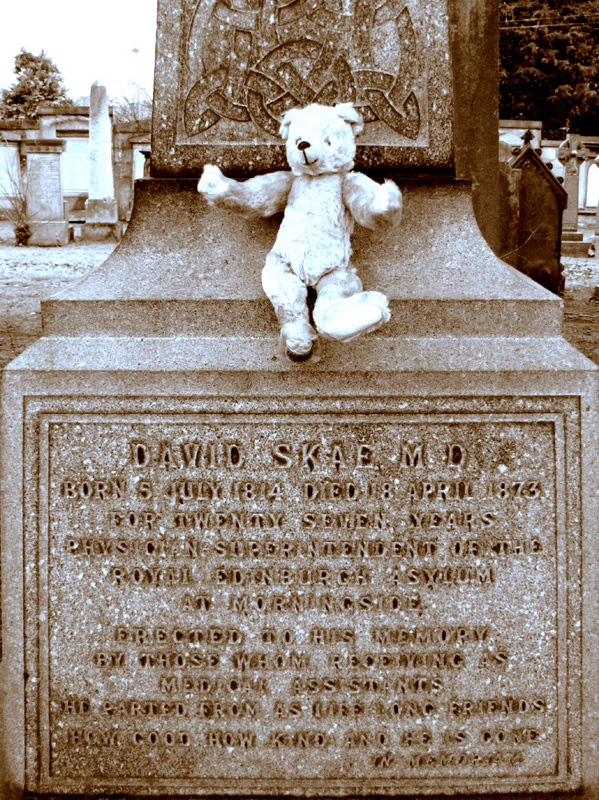 In death, Skae was not remembered in the way his students so wished, rather he was remembered for his classification as deemed misguided and false. 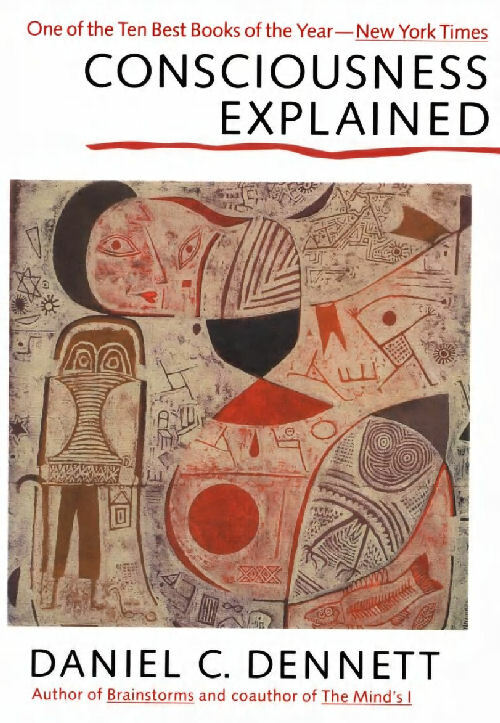 Yet today, if one looks through the categories of diagnoses in either of the major classifications of mental disorders one finds that Skae’s premise has re-appeared as the authoritative one. Perhaps one day science will help us here but only if it considers our biological selves, our cognitions as understood through the world in which we live. This is the truth, the reality, of the humanities. I am with those who argue that neuroscience is trying to create a theory of everything that it simply isn’t qualified to offer. In short, I am terribly worried about reductionist explanations of human nature. It is our very need to ease suffering that brings great passion to debate. Understanding requires that we must see the real world through more than our own window: today’s mental biologism is not enough: it is necessary but not sufficient. Equally quantitative evidence base is necessary but requires qualitative understanding. Darwinitis is a frightful contagion that has spread beyond science to infect sociology, politics, literature, and more. Darwinitis has snatched our bodies and carried them back only to resurrect them in the Pleistocene age. Many academics today are convinced that Darwin’s science is a universal solvent that can sort out the most recalcitrant problems of society, consciousness, politics, literature, and more. They mislead themselves. Great philosophers are those who enable us to see the world differently. Mary Midgley, in her eighties, writes about subjects that are both complex and important. One of her targets has been the claims about human nature made by evolutionary biologists such as Richard Dawkins and EO Wilson. Her argument is simple that whilst an evolutionary appreciation is necessary for understanding our biology it is not sufficient. Today there are devotees to Evolutionary Medicine, like Randolph Nesse, who demand that an evolutionary framework should be the ‘over-arching’ framework to our mental ‘architecture.’ I have discovered from my philosophical readings that I am not alone in dismissing this as Pangloss. You will recall from chapter five that our first village doctor, and my genetic forebear, was a student of the monocular populist anatomist Dr Robert Knox. My forebear admitted to his daughter that along with medical student pals he had been a ‘Resurrectionist’ (a body snatcher) for Dr Knox. With the 1828 scandal of Burke and Hare he decided his best ploy on graduation was to leave Edinburgh behind and become a ship’s doctor. Only two years later, after the terrible hoo-ha had died down, and Burke had been executed, did my forebear dare return to Scotland. It was then that he returned home to our village where Gilbert Farie was soon to establish his pharmacy. It is no wonder that I share Robert Louis Stevenson’s fascination with the body snatchers, and such curiosity brought me to seek out the lost ‘tounship’ of Carlindean, which lies on the gentle hills above Carnwath. Today any visible history of Carlindean isn’t even ‘ankle high’ yet it was here that Burke and Hare found employment for one autumn season. 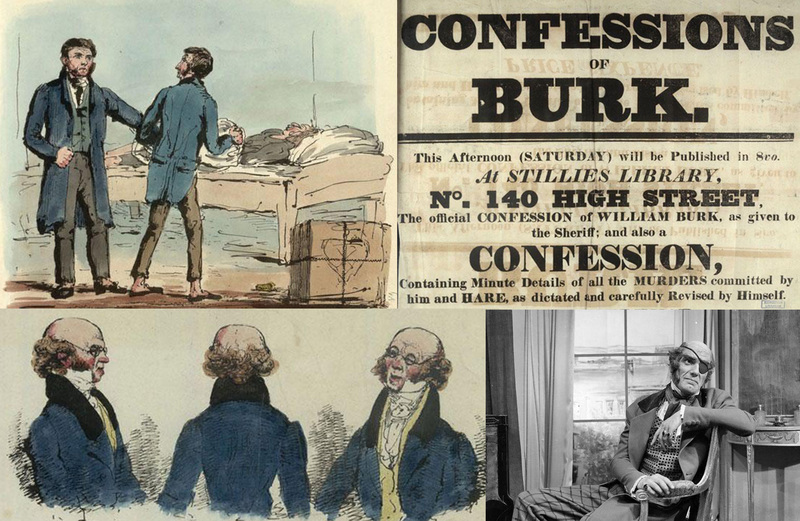 Burke and Hare lodged with a woman with a curved spine and then murdered her at Carlindean before they left. 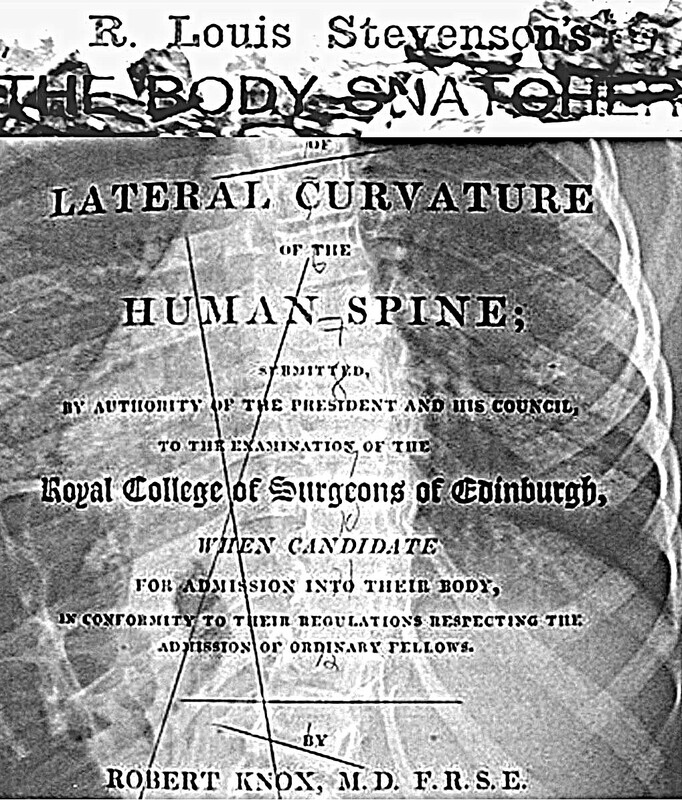 Dr Robert Knox, the Edinburgh Anatomist, had since his student days, a deep fascination with spinal curvature. There is something most twisted about body snatching (Darwinitis). It strangles cultural life (our lives so lived) out of our bodies. Even Gilbert Farie understood this and he himself was an ankyloid kyphotic. I recently wrote a piece on another village doctor who served generations of my family in the time of Darwin. Dr Daniel Rankin was a favourite eccentric in Carluke, a rural Scottish village, where he was regaled for his long flowing hair, massive torso and awkward but yet kindly temperament. He spent all his non-doctoring moments collecting fossils and supplied them to the HunterianMuseum and met with the ‘Bulldog’ but not Darwin himself. 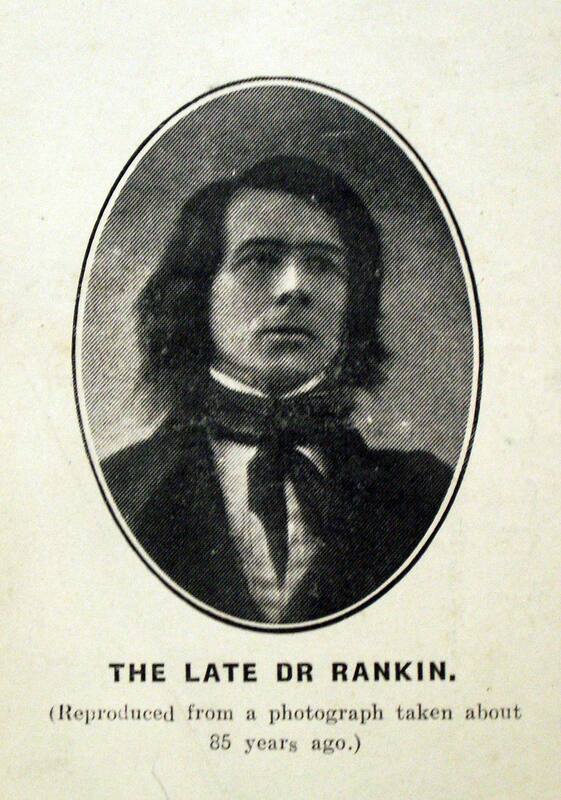 Anyway Dr Rankin used to wear a long coat, and for reason presumably only to shock, used to greet returning ‘heart-sink’ patients by standing on his head! This has left me wondering what his Pangloss coat revealed underneath: presumably a man living and shaped as much by his culture and family, as he was by the evolution that he helped understand. The most important talent for a darwinian is to know where his subject stops. This year, the northern lights, the aurora borealis, have been more spectacular than any other that I can remember. Mica, in the novel ‘In Another Light’ put this more prosaically with added observation of her own: “it happens quite a lot in winter,’ she said quietly. ‘Some things you can see properly only if you live away from the bright lights.” This section is going to talk about the bright lights of the voxel-based coloured-lit neo-phrenology of functional magnetic resonance imaging (fMRI). The wrong box may be the fMRI scanneror it may be, as I intend it here to be the cranium understood for the brain only, without body or the environment within which the person so lives. Maurice Merleau-Ponty was a thinker steeped in neuroscience but able to resist capitulating to it. His view was that to be a conscious person we engage in complex relations with objects, and these relations depend on the whole human being, not simply on the brain: a disembodied brain could not be said to have conscious experiences of objects, but only to provide some of the necessary, but not sufficient conditions for the conscious experiences. 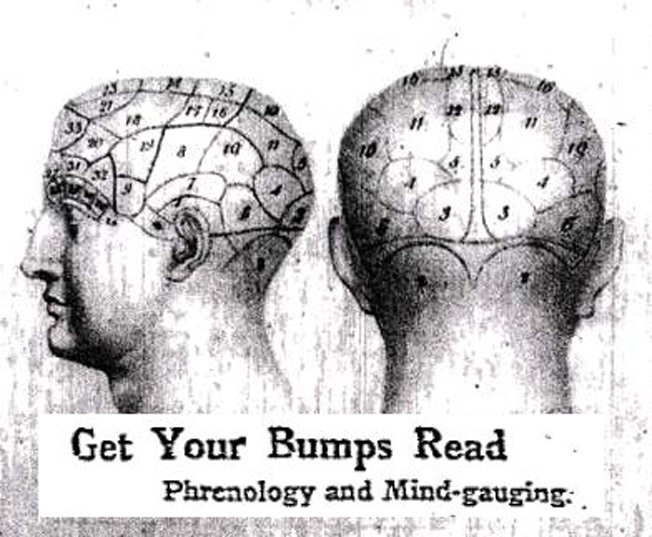 The science of Phrenology taught us you can read a person’s character from feeling the bumps on their skull. It was a dumb science that achieved greater public authentication than Darwin’s theory of evolution. Edinburgh, the Enlightenment capital of the world, was also capital of phrenology thanks to the brewer’s son Andrew Combe (1797-1847). Nobody did more for disinterment than Combe: skulls all over Scotland were dug up and examined for their bumps: even our greatest heid, Rabbie Burns, had his skull disinterred for this ‘science’. It is impossible to imagine that Burn’s skull could reveal more about him than his words. Physicalism comes in ever so many guises: Londonderry August, 1898, “Photography as an aid in the diagnosis of insanity,” and today it comes in bright fMRI lights. Understanding the biological basis for ourselves is fine (I support the advance in imaging, and the science of this), but as Dr Saad Ghalib has quietly recommended: we need ‘physics to come to our rescue’ as not everything that is real has an appearance. 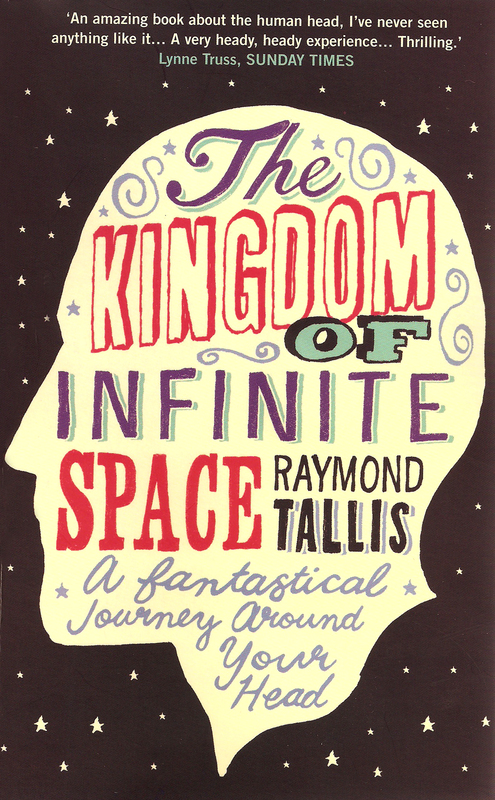 Raymond Tallis in his book ‘The Kingdom of Infinite Space’ managed the impossible, to study the head but avoiding discussing the brain! I go along with Tallis that science needs a “bit of corrective action” for we have indeed had too many headless brains. Perhaps we could teach the parrot that belonged to Dr Juvenal Urbino to voice this for mankind? ‘This is not yesterday’ serves as one family exposé that DNA is over-rated in understanding. I write so boldly “because I was nearly dead once . . . and I’m trying to live with that I return to over-medicalization because I believe we have seen monumental changes in our approach to life and in ways that the sociologist Ivan Illich could never have predicted. I am careful in my writings not to blame medicalization per sae but cannot help myself considering the potential of unforeseen consequences that such an approach may have for society at large. Despite a lack of supporting evidence, the claim that one in four people will have a mental health problem at some point in their lives is a popular one. For journalists, quoting a high prevalence of mental disorder helps illustrate the newsworthiness of stories about mental health. 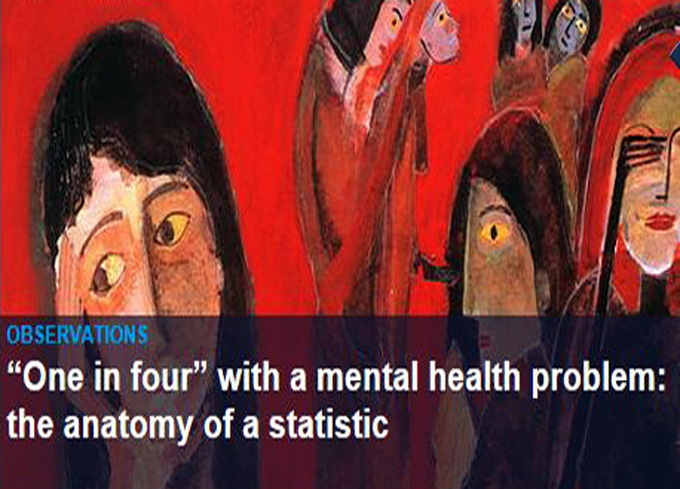 It is important that people know that mental suffering is common and that our collective goal must be to reduce this, but it is not clear that championing a poorly supported prevalence figure is the way to achieve this. Often today we are seduced by so many familiar assumptions: newer is better; widely used procedures are all proved; a registered drug must surely be a safe one. But perhaps the unhealthiest fallacy of all is the popular conviction that early detection is always for the best. A number of medical researchers are now suggesting that overdiagnosis is one of medicine’s biggest problems, causing millions of people to become patients unnecessarily, producing untold harm, and wasting vast amounts of resources. I am naturally wary of wolves. ‘What is it. 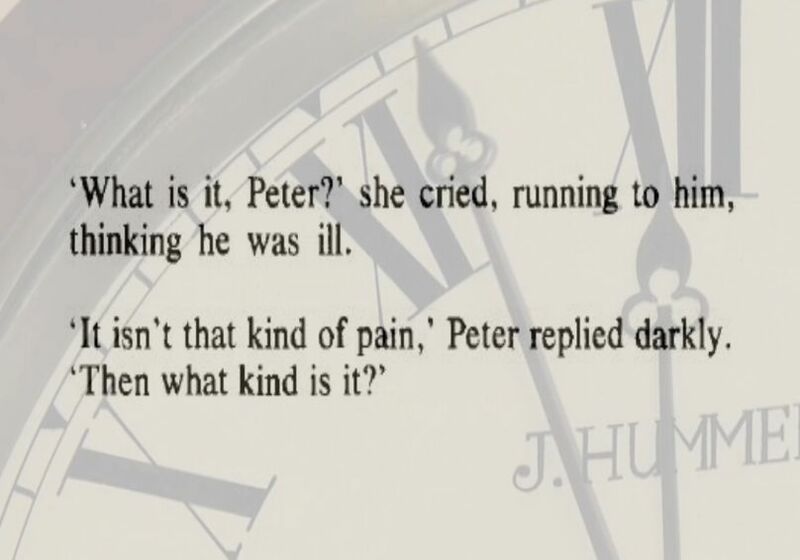 Peter?` she cried, running to him, thinking he was ill.
‘It isn`t that kind of pain` Peter replied darkly. Daniel Dennett in the book where he did not explain consciousness famously said: “There is only one sort of stuff, namely matter – the physical stuff of physics, chemistry, and physiology – and the mind is somehow, nothing but a physical phenomenon. In short, the mind is the brain . . ..” Dennett does not shy away from expressing his wisdom as one of the ‘Bright’ club: and he will be pleased that he illuminates my brain coloured fMRI bright. I do however share Dennett’s naturalistic view in the sense that I see no need for mystical explanations. 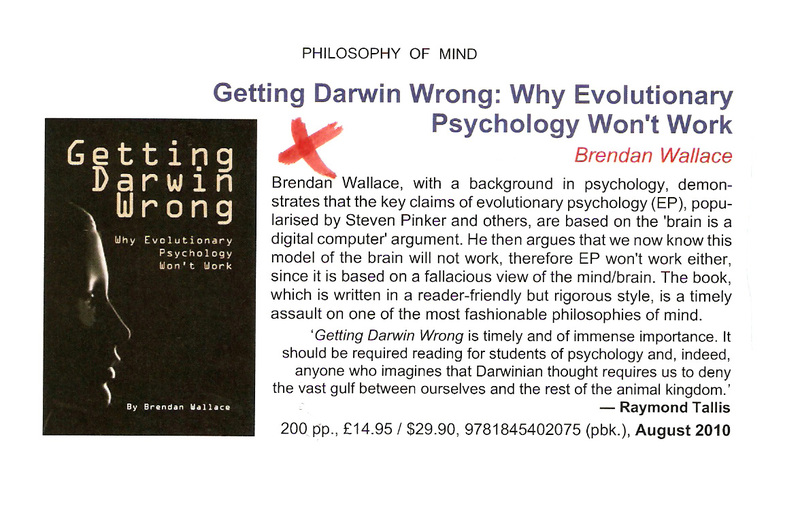 Where I differ is his neuroevolutionary view. Such a view lacks patient sense. In this section I will briefly try and explain why. When Charles Dickens looked back on his early years, he remembered himself as a delicate and sometimes lonely child, unable to join the games of the local boys. As a result he later told his friend John Forster that “he grew used to watching, and being set apart from those watched.” I have no common ground with Charles Dickens other than this. As I have grown older I have learned to trust my observations and especially when I feel discomfort or dissonance with what is being offered as understanding, scientific or otherwise. In my sanctum sanctorum I try to express this in a creative way. I feel that it matters even if others do not. 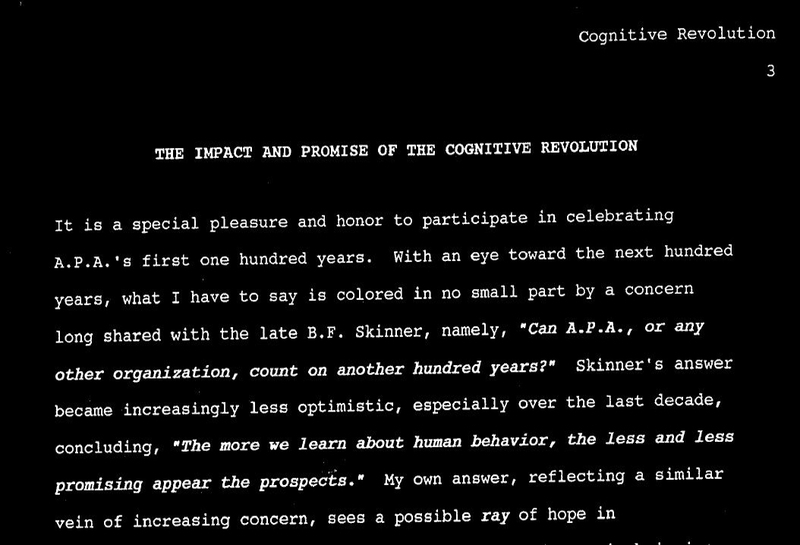 In the year before he died the Nobel prize winning neurobiologist, Roger Sperry wrote a paper entitled “The impact and promise of the cognitive revolution.” His main argument was that he believed that a ‘cognitive revolution’ in psychology would lead the way among the sciences to a new and improved, more comprehensive, adequate, and valid conceptual foundation for scientific as well as for all causal explanation and understanding. Sperry felt that other (non-biological) disciplines, even physics, were beginning to agree and join in, discovering and adopting new less reductive a and emergent insights. Unfortunately in the twenty years that have passed since Sperry’s death the ‘hard sciences’ have rallied in the opposite physical direction. Indeed Peter would say that today we live in a world weighed down by mighty materialism. 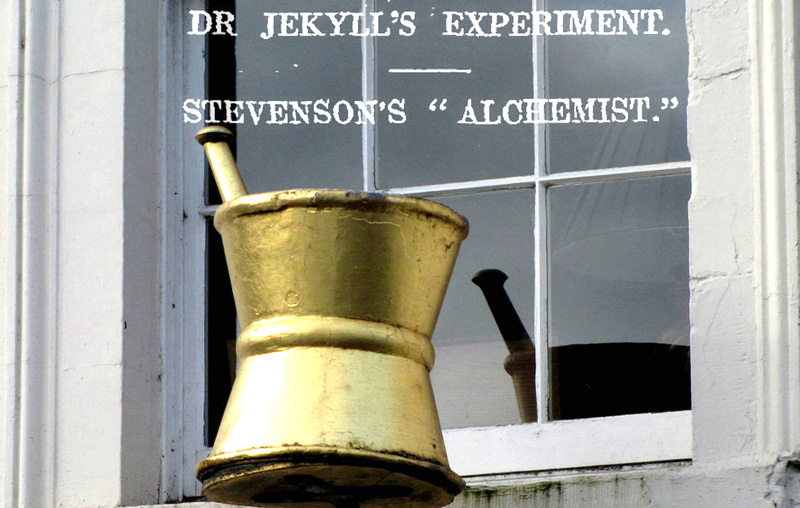 In a recent head-to-head debate on the future of psychotherapies in the British Medical Journal I was struck by the degree of ‘Jekyll and Hyde thinking’ and left saddened given that nothing has helped me more in my life than in gaining cognitive insights. The sort of cognitive approach that I would espouse is: integrated with drug and other therapies; open to empirical investigation of efficacy and mechanism of action; teases out the ways in which social stress impacts on the developing psyche via difficulties in relationships; and helps clinicians understand the ways in which their decisions may be adversely influenced by forces of which they and their patients are unaware. Shortly before he died, Leon Eisenberg, author of ‘Mindlessness and brainlessness in psychiatry’wrote me a note of thanks. I had written to him that this, his 1986 paper, still held up today. In review of this current head-to-head Leon Eisenberg might have said that those against the argument were rather ‘mindless’. Let me rephrase this, in Gilbert Farie terms: ‘Jekyll and Hyde thinking’ has surely only served to damage the further understanding of biological and cognitive science. Our media daily deals with ageing but not necessarily in a way that best serves us. I suspect this is not the media’s fault but one of which we should all take collective ownership. As I have aged my views have changed but my self probably has not left behind the boy who observed a world from behind a half-closed door. 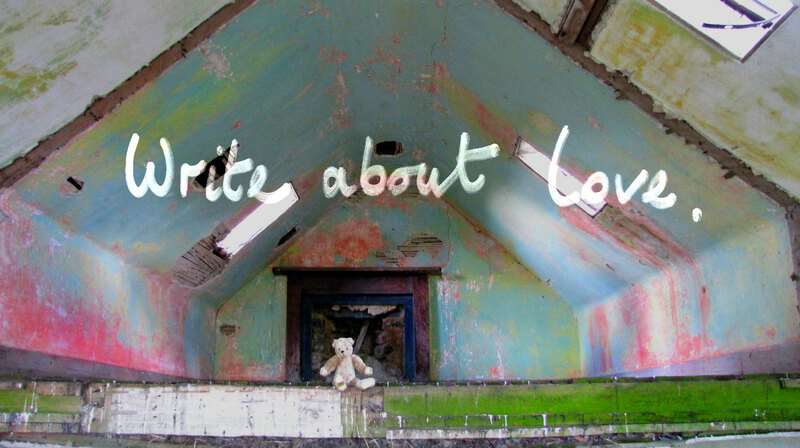 Letters and narrative still move me in just the way they did when first read. I still treasure the letters of Maggie Boag who wrote as a 16 year old friend of my grandmother removed by three generations. 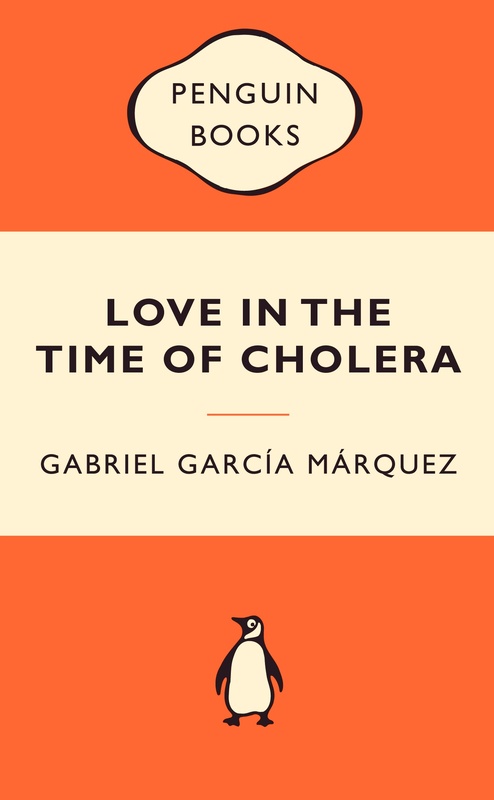 This was 1830 and the fear of cholera was visceral: our village was in panic. 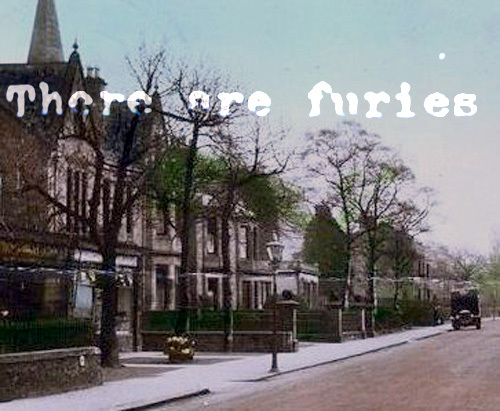 In her letter’s Maggie voiced this with frightening innocence. I was made aware of John Betjeman’s rallying call against unnecessary bureaucracy when I studied Landscape Architecture in Edinburgh. 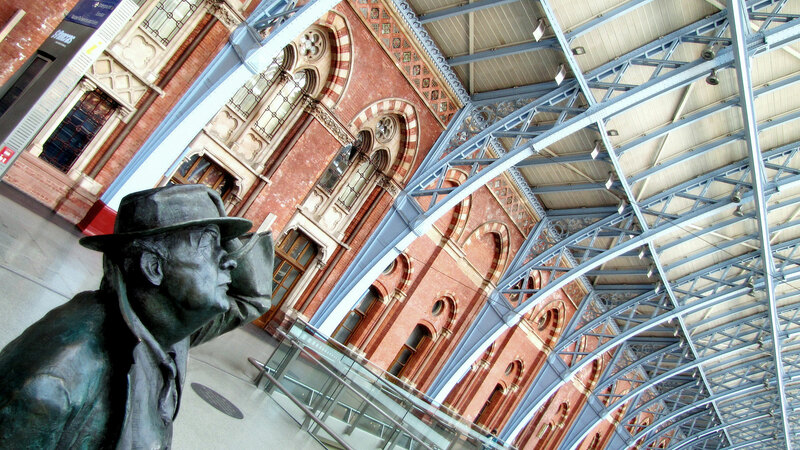 I have often had Betjeman walking through my films to remind us of silly talk. ‘The Planster’s Vision’ captures remarkably the sort of voice never before heard in a sonnet. This is the voice of a town planner anxious to erase the symbols of history and replant the landscape with a Maoist vision of collective banality. Betjeman fulminates against a dystopic future in which church bells are silenced by loudspeakers indoctrinating the masses until they have become brainwashed drones. A colleague of mine, with whom I am to share a keynote address this October has suggested that we consider two hypothetical models of ageing. One is the model of a master clock (or indeed multiple clocks) inside the organism that gradually run down. As the clock advances, the organism ages. A natural thought to prolong life is to somehow slow down, or stop, the internal clock. An alternative model is based on an analogy with how elderly cars age. The thought is that small failures inside a car’s mechanism may, by themselves, be un-troubling, but these small failures get exacerbated by repeatedly coming into contact both with each other, other components of the car, and an uncooperative environment. The on-going interaction between these elements can grow what initially seem to be small failures in large and unexpected directions, and place them beyond the ability of a repair mechanism to fix. The malfunctioning here does not involve a single localisable internal failure, but is the result of any number of internal abnormalities that are supported by, and reinforced by, the feedback the car receives from its environment. The fMRI dream of psychiatric imaging follows roughly the master-clock model. Psychiatric disorders are a matter of one (or more) neurological functional failures. The dream is that taxonomising, diagnosing, and treating the disorder can be done in terms of taxonomising, diagnosing, and treating the underlying neurological failures. 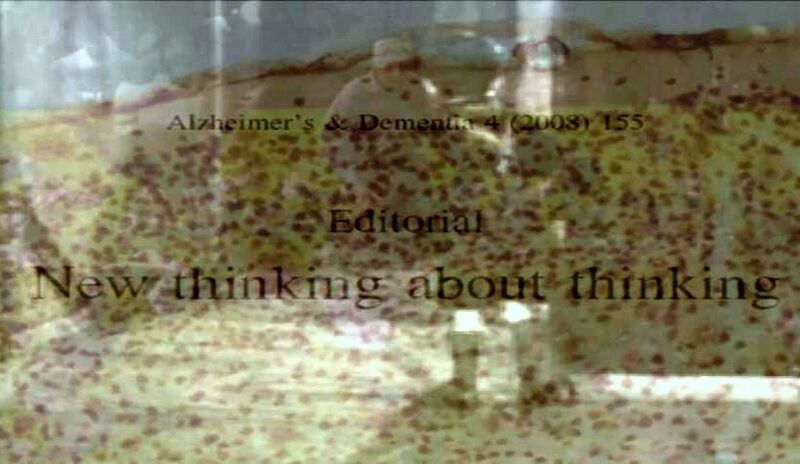 An embedded account of psychiatric disorders would follow roughly the elderly-car model. Psychiatric disorders may not have a single identifiable internal malfunction. Rather, they are the product of small, perhaps otherwise un-troubling, internal misfunctions, that jostling together, and being reinforced by an uncooperative environment, snowball, and contribute to wider breakdown. To some extent or other we all compete with one another in our vision of the world that surrounds us. There are windows in every moment of all 7 billion of us. My own window, I keep trying to clear dust and dirt from, but through it I see a special world that faces all sorts of challenges. I am not interested in celebrity or power but I am interested in improving our collective understanding and here my endeavour will stop only on my death. As a child I did not have a voice. I guess this is why as a boy who has grown into a man, who tries to bridge the sciences and humanities, I have turned to more expressive art-forms such as film-making, story telling and garden poetry. Like most film-makers I employ symbolism in my films, and this section gives me an opportunity to explain such symbols most briefly. Wolves I use to represent medicalisation. 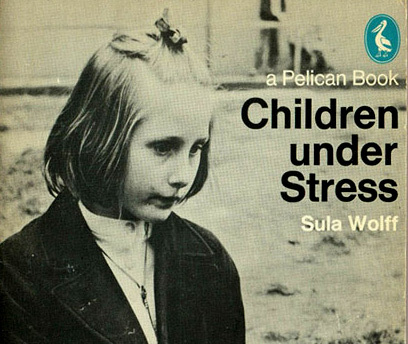 I must stress here that I do not blame Dr Sula Wolff for my sister’s problems; however I do think the strict medical approach that focused only on Catriona made matters worse for Catriona, her parents and siblings. Elephants are used in my films to suggest what might be missed by science. Principally here I consider the world of interactions that shapes us, and our social and cultural worlds which are too easily ousted from much of scientific endeavour. The teddy bear is called Hale Bopp. He was bought for Andrew on the day of his birth. The teddy bear represents the intrinsic brightness of my children in the world. My family make my world the wonder that it is. The multi-headed Hydra monster is used for stigma. I guess we have all faced stigma in our lives! Chop off one head of the Hydra monster and another grows. 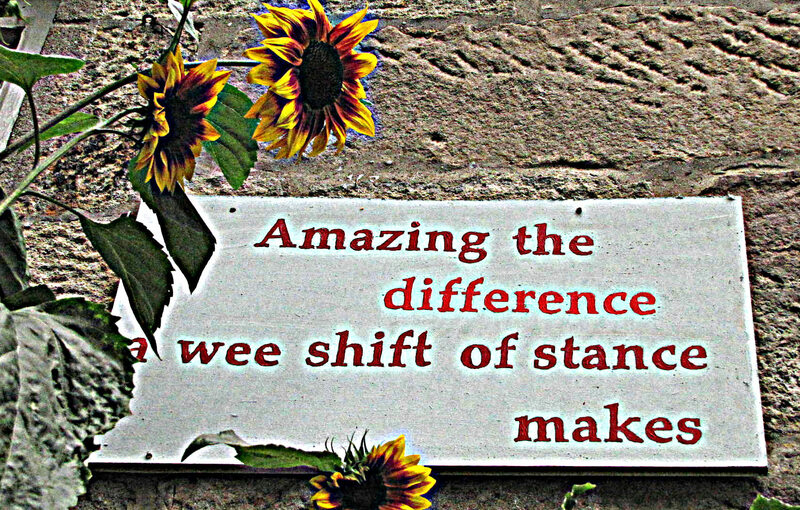 It is not the simple case that giving a ‘diagnosis’ reduces stigma. Research in its beginning supports my ‘feeling’ that such is fallacy. (10) Treasure Island: where we find reason not gold. 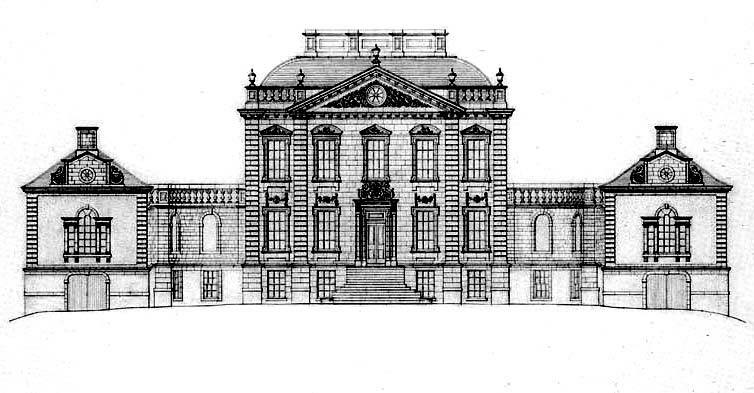 As a trustee of Mavisbank House I have come to appreciate the optimism of the 18th century Enlightenment which consisted in a belief in reason, science, universal moral ideas, and human progress. Today we have lost some of this roundedness and C.P Snow was correct to draw our attention to the divide that has opened between science and the humanities. Fortunately however my belief is that we practise continually an almost unconscious revision. Nevertheless, quite a fundamental shift of stance that is required here and I am one of those increasing number who insist that it is time for philosophy to reassume its fundamental duty: to look critically at the conceptual framework and presuppositions within which contemporary thought operates. The dominant myths of science are atomism (the view that the world is divisible into basic units), reductionism (the view that the world is only properly understood in terms of these basic units), and materialism (the view that the world is both ultimately analysable in terms of physical science and that there is no spiritual, i.e., non-physical aspect to reality). Mary Midgley argues that these guiding principles, are “either derived from or greatly supported by powerful metaphors that are not themselves the result of scientific investigation but are, rather, metaphysical presuppositions.” I am not sure that I am prepared to generalize to this degree but I do think that to accept science as the last word on the mind is to overlook that which made science possible: the mind itself. I have quoted Andrew Greig and his philosophy (of narrative) several times already, but this thought of Dr Alexander Mackay in the novel In Another Light made me laugh out loud: “Sandy considers it, as he has often, though he doesn’t believe in anything so irrational as luck. There are reasons for everything, though some are pretty damn mysterious.” The discovery of penicillin by Fleming illustrates Pasteur’s dictum that chance enters only the mind that is prepared. Many people, including Pasteur himself, must have seen their culture plates contaminated by moulds, but only Fleming saw the significance of the sterile ring surrounding the spot of contamination. To consider science as a whole it is crucial to gather all available evidence-base, but also not to dismiss a collective narrative less quantifiable. Medicine, as a branch of such a tree, should accept that numbers (that which is quantifiable) and words (the qualitative) are equal forms of measurement. It is disappointing that we need reminding of this essential evidence and that the individual story risks being lost in pursuit of ever greater denominators. It is time to close this chapter. I have given you ten considerations that will always need reconsideration. Think of me giving more thought to them as I revisit Gilbert Farie. 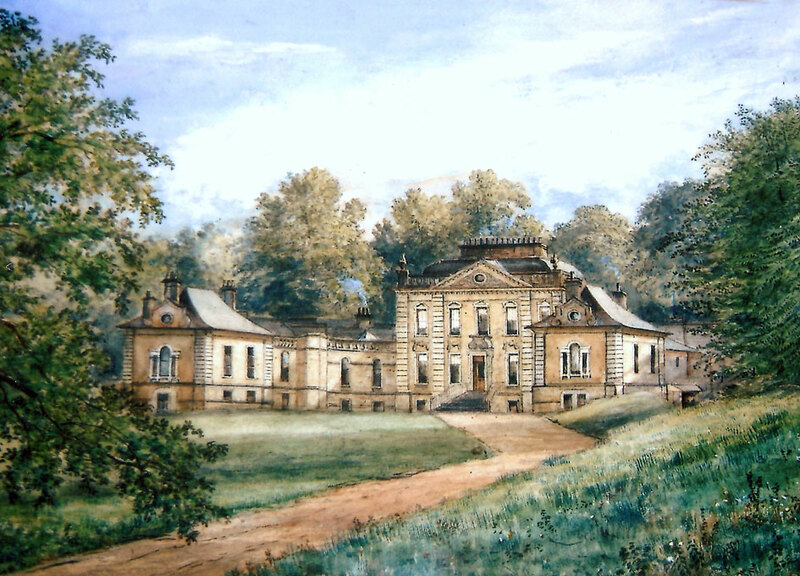 Eisenberg, Leon. Science in Medicine: Too Much or Too Little and Too Limited in Scope? antidepressants has contributed to the worldwide reduction in suicide The British Journal of Psychiatry (2010) 196: 429-433. Dennett, D. Consciousness Explained, 33. Tomalin, C. A quote about Charles Dickens. Page 50. A Life. “Robert Farie, bookseller, Saltmarket”. In Jones Directory for 1789 he is again listed as “Robert Farie, bookseller, Saltmarket, shop no 16”. And in the Post Office Directory for 1801 he appears as, “Robert Farie, bookbinder, Saltmarket”. The Glasgow of Robert Farie was one of transition, much yet remained of the old, but the first manifestations brought about by industry were to be seen. Glasgow’s first period of marked growth was in the 18th century, and was brought about by trade with the American colonies, largely in tobacco and sugar. Glasgow Cross was the centre of the City when the Tobacco Lords strutted about in their finery outside the Tontine. The shop of Robert Farie was close to the heart of this world. In 1700 the population had been 12,000; in 1800 it had become 77,000. The City was on the move. The Exchange was soon to move from Trongate to Queen Street. The bookbinding business of Robert Farie also relocated in 1819 to 54 Trongate and remained there at Post Office Court for 10 years. It moved then to 57 Argyll Street, whilst his own residence was at 57 Oswald Street. In 1838 the firm became Robert Farie & Co, and we find a James Farie, presumably a son, working in the business. In 1842 the firm is listed as Farie & Nelson, Bookbinders with the Nelson partner being a Thomas Nelson. I have not had the opportunity to investigate this link further but the date would hint that this might well be Thomas Nelson Jnr, son of the founder of the publishing house which was founded in 1789 by his father, Thomas Nelson, a native of Throsk. The bookbinding business ceased in 1848. Gilbert Farie was born in 1832 whilst the family resided at 57 Oswald Street. Close family relatives, Robert Farie, merchant, 23 Monteith Row and Gilbert Shearer Farie, merchant, 30 Monteith Row, a Cotton Yarn Manufacturer of the firm Johnston & Farie, cotton yarn merchants, 62 Wilson Street, showed by their fashionable street address that they belonged to the wealthy merchant class of Georgian Glasgow. Other family members the Farie’s of Farme had considerable coal interests in Lanarkshire. Some of these family members appear as visitors to the Spa in the Bridge of Allan Reporter in later years. According to his obituary in the Bridge of Allan Gazette Gilbert Farie had studied at the University of Glasgow and had assisted a Dr Penny at the Andersonian Institute, now Strathclyde University. He was appointed apothecary at Glasgow Royal Infirmary. However in 1851 he came to Bridge of Allan as assistant to Charles Neil Rutherfoord , at that time the only Chemist and Druggist in the village and indeed the Census return for 1851 shows that Gilbert was living in the same house as Charles Rutherfoord . The year was 1851. What was happening in the nation at that time? A distinguished historian on the Age of Queen Victoria wrote, “Of all the decades in our history, a wise man would choose the eighteen-fifties to be young in”. There was a general optimism after the economic difficulties of the 1840s; the cost of living had come down and improvements had been introduced in the area of social justice. The drift from countryside to town continued to accelerate and half the population of twenty million were now urban dwellers. For the youthful in 1851 the prospects were certainly encouraging and there is significance in the very prevalence of the expression, “to rise in life”. For the commercially minded the age was an ideal one, and for technicians, all sorts of new careers were opening up as scientific advances were made. In the world of Pharmacy, 1841 had seen the establishment by Royal Charter of the Pharmaceutical Society of Great Britain. 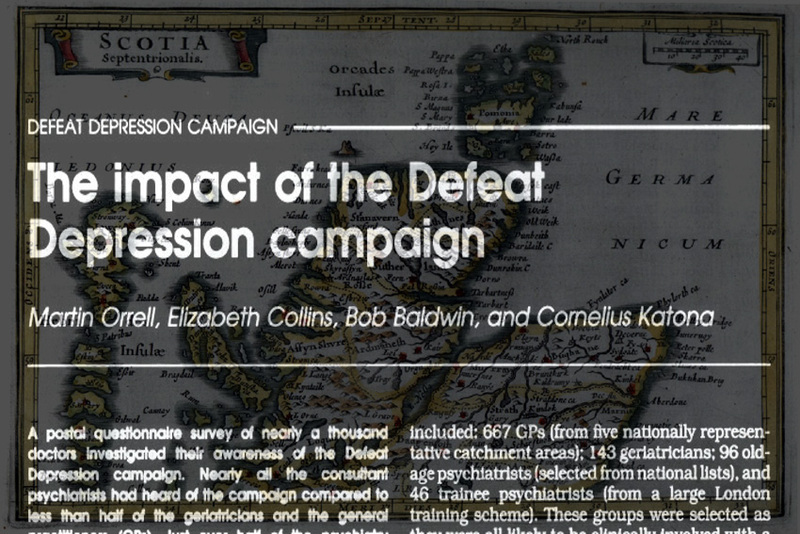 Only nine out of approximately 700 members were resident in Scotland. There were many more working in Scotland as Druggist Apothecaries, or Chemists and Druggists. Many of these wished to become Members of the Society but in order to sit the examinations it was necessary to travel to London. 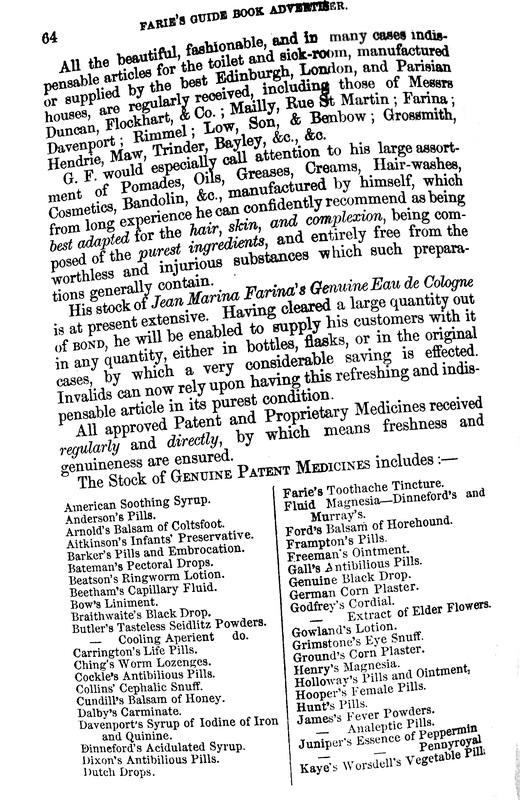 The Pharmaceutical Journal in 1851 included an Editorial , part of which read, “We are informed that there are many other Chemists in Scotland desirous of becoming Members, but precluded from doing so because it is not convenient to them to come to London to pass the examination” That year a Board of Examiners was appointed in Edinburgh. Gilbert Farie registered as a Member of the Pharmaceutical Society of Great Britain on June 1 1853. He had by that time established his own pharmaceutical business in Bridge of Allan which he called Bridge of Allan Medical Hall. 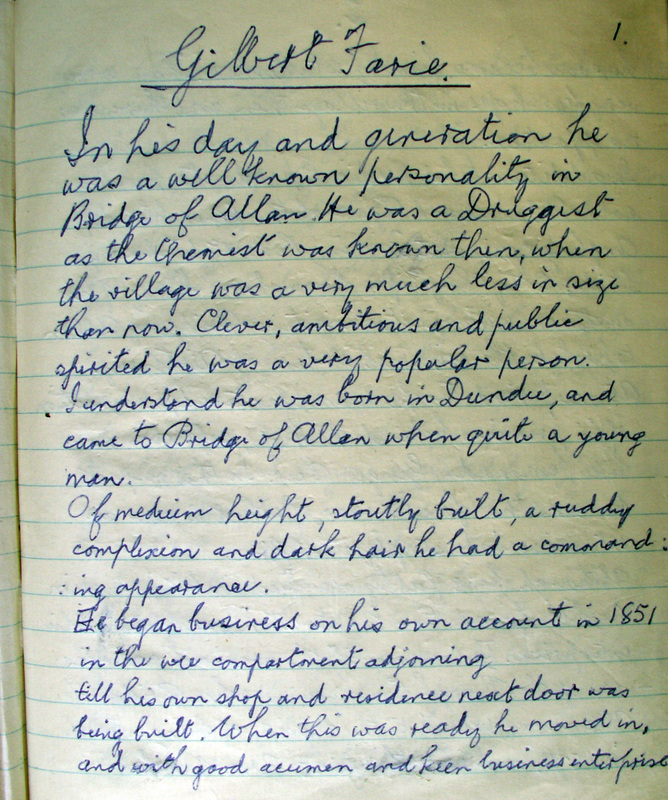 His obituary in the local newspaper tells us that it was in premises, “presently occupied by Keith & Ralston.” There were many visitors coming to the Spa and Charles Roger’s publication “A Week at Bridge of Allan” was acting as a guide to the locality for them. 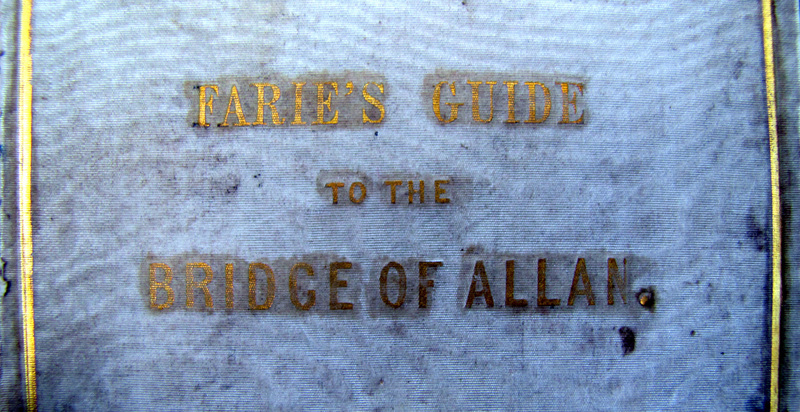 Perhaps however because of his background with a father who was a printer and bookbinder he commenced publication of his own guide to the village entitled Farie’s Guide to Bridge of Allan. By 1858 it was in its fourth edition. It is interesting that one of the advertisements in that edition was for a bookbinder, Colin Frame, who respectfully intimated that he had removed from Royal Exchange Court, 85 Queen Street, Glasgow to 90 Mitchell Street, first entrance below Gordon Street. 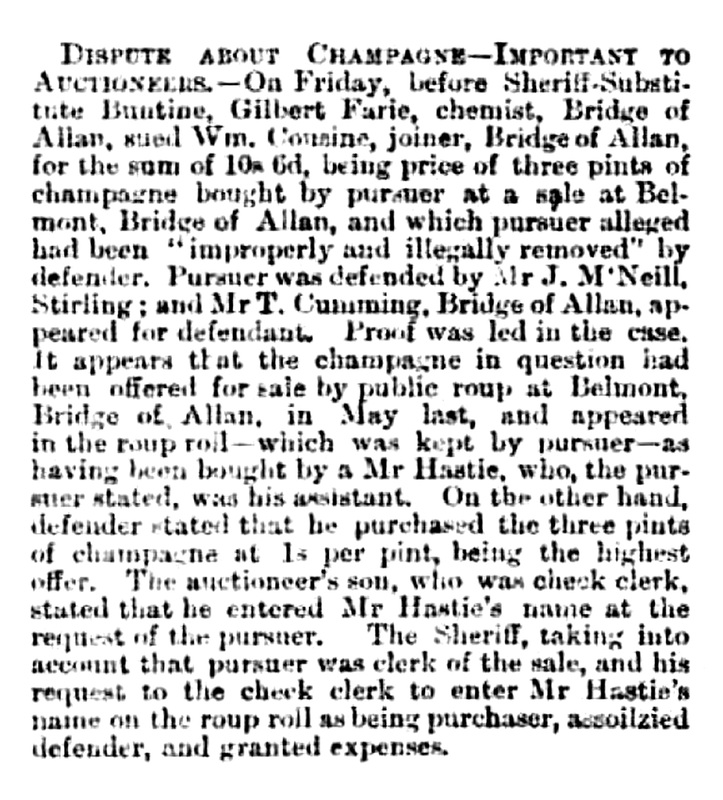 Gilbert Farie’s mother’s maiden surname was Frame and on August 6th 1858, a Mr Colin Frame and Mr Robert Frame were listed in the Bridge of Allan Reporter as visiting Bridge of Allan. Since in later life Gilbert’s first son was named Robert Frame Farie, I would guess that these gentlemen were Gilbert’s uncle and grandfather. In 1851 Bridge of Allan held the first Strathallan Meeting in the grounds of Westerton House so in 2001 the Bridge of Allan Highland Games also celebrated its 150th anniversary. In the 1852 meeting there were 23 events and the last event, the Pony Race was won by Gilbert Farie. By 1858 he had become the Secretary of the Strathallan Gathering. 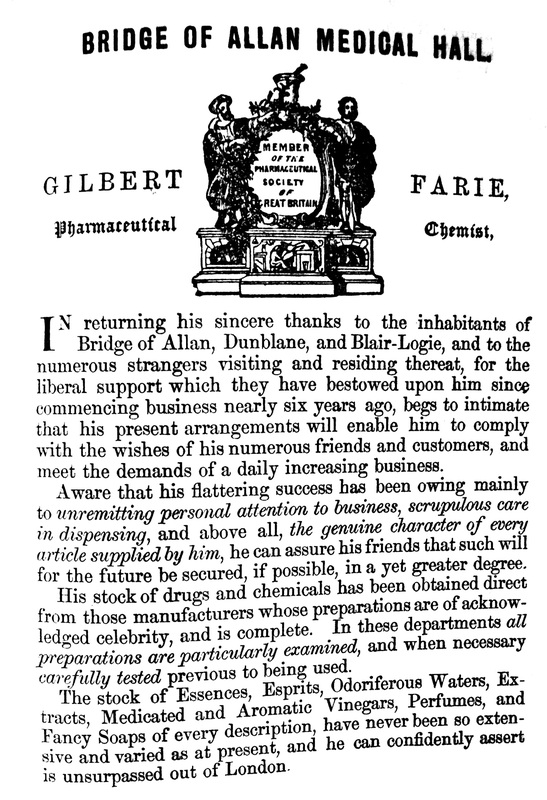 “In returning his sincere thanks to the inhabitants of Bridge of Allan, Dunblane, and Blairlogie, and to the numerous strangers visiting and residing thereat, for the liberal support which they have bestowed upon him since commencing business nearly six years ago, begs to intimate that his present arrangements will enable him to comply with the wishes of his numerous friends and customers, and meet the demands of a daily increasing business. To say that this young man had his fingers in many pies is putting it mildly. In 1858 he was the Secretary and Treasurer of the Bridge of Allan Concert and Music Hall, which occupied the site on the corner of Fountain Road and Henderson Street where the supermarket currently sits. When in 1860 an exhibition of wax figures, including the Royal Family – life size – came to the Music Hall. Cards of Admission were available from Mr G Farie. For most Spa residents and visitors this would be perhaps the only opportunity to see an approximation at a likeness of their Sovereign. Orders were taken at his pharmacy for the hiring, tuning and repairing of harmoniums – also mouth harmoniums were offered for sale. 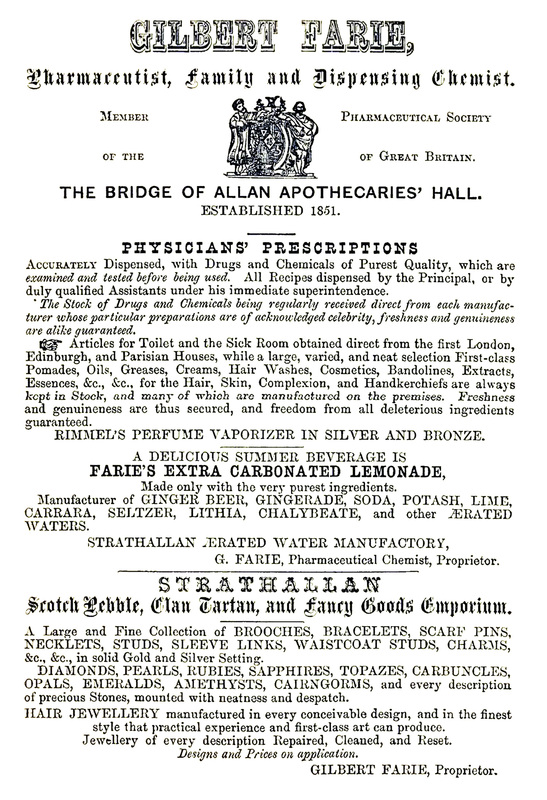 In 1866 he was advertising Farie’s Extra Carbonated Lemonade from the Strathallan Aerated Water Manufactory and the Strathallan Scotch Pebble, Clan Tartan and Fancy Goods Emporium. There is no doubt that he sought to benefit at every turn from the visitors who were at that time flocking to the Spa. His business was prospering and in 1857 a decision was made to re-locate to new purpose built premises. What should be more natural than that a son of Glasgow should have the plans drawn up by a Glasgow architect who had opened his own practice in 1844. The name, John Burnet, 113 West Regent Street, Glasgow appears on the plans with the date 1857. And so the current premises occupied by Strathallan Pharmacy opened on 7th May 1858, the work of the same architect responsible for Merchants’ House, George Square; the Clydesdale Bank, St Vincent Street; and the Glasgow Stock Exchange. Dr Paterson and Gilbert Farie were both professional colleagues and friends, and one day whilst out walking together in the vicinity of the Airthrey Paper Mill were called to attend to a female mill worker whose dress became caught up in a machine. She was dragged into the machinery and the doctor and pharmacist performed an amputation. The patient survived for a few days but then died. On another occasion they performed a similar operation in the Waiting Room of Bridge of Allan Railway Station on Peter Jaffray, the local plumber. He had fallen from the platform when the train moved off and had his arm severed under a carriage wheel. The New Medical Hall was open from 7am until 9pm during the week, and on Sundays from 10-11am and from 6-8pm. When the establishment was closed medicines required in the case of emergency could still be obtained at all times by ringing the Night Bell at the West End of the House. The night extra charge from 9pm to midnight was sixpence, and from 12pm to 7am one shilling. Since Gilbert did not reside on the premises I should imagine that an apprentice was responsible for night duty. Indeed Strathallan House which occupied the rest of the premises not part of the Medical Hall had a landlady and took in lodgers whose names appear in the Visitor Lists published in the local newspaper. On 2nd August Mrs Forsyth’s lodgings at Strathallan House were visited by Mrs Robert Farie; the Misses Farie; and Mr Robert Farie. And they remained throughout the entire months of August and September leaving in the week after the 27th September. There were frequent visits of his Glasgow family members who in 1865 stayed for Christmas at Strathallan House. Throughout all this period Gilbert Farie had remained a bachelor. And indeed it was not until 1878 that he married Anne Haywood, the daughter of a wealthy Nottingham industrialist. Quite how they met will forever remain a mystery. What is known is that her father John Shrewsbury Haywood, a hosier, of Nottingham first conceived the idea of the first elastic stocking. In a city which was renowned for its hosiery business he produced a stocking which would not only lend support to a limb, but would also, at the same time, give and stretch. This is the basis of the method still in use today. His son, Anne’s brother, John Harrington Haywood joined his father in the business and his remarkable discovery was the seamless stocking of which he was the sole inventor and patentee. The Haywoods lived in Alexandra Park on the outskirts of the city of Nottingham in a small enclave of fashionable houses. One of their neighbours was John Player, the tobacco magnate. I have visited both Shrewsbury House, the family home and St Andrew’s Church in which they were married on the 14th November 1878 and have seen the marriage register which interestingly contains the unsteady signature of an elderly Robert Farie, father of the groom. The newspaper account of the proceedings gives a fascinating insight into a Victorian wedding. John Harrington Haywood who had acted as groomsman at the wedding went on to succeed his father in their business in Castle Gate, Nottingham. At one time a certain D H Lawrence aged 13 was employed manually at a wage of 13/- a week. He did not stay long, but left to become a pupil teacher. 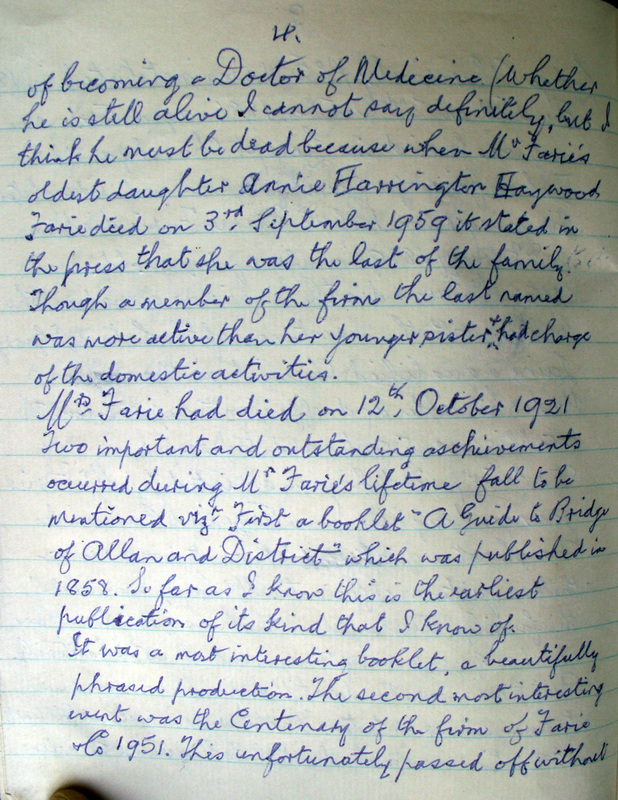 As a novelist Lawrence used a Nottinghamshire background in his “Sons and Lovers” , a story that is to some extent autobiographical. Lawrence makes his character Paul Morel, at the age of 14 years, apply for a job with a firm called “Thomas Jordan and Son – Surgical Appliances” whose place of business was off a narrow street that led to the Castle, where, through a dark archway, he found “ a big warehouse, with creamy paper parcels everywhere” in which he was to work as a clerk. 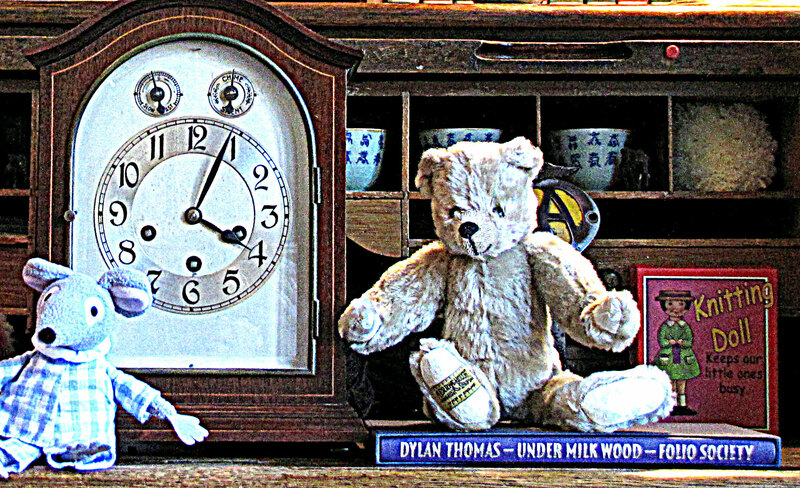 Some of Haywood’s older employees were able to recall the likeness between the author’s characters and the people who worked at Haywoods. I have searched the Visitor Lists for Bridge of Allan and Dunblane for visits by the Haywoods prior to 1878 and have not found any. As I said earlier the circumstances of their introduction remains a mystery. On the 26th August 1879 their first daughter, christened Annie Harrington Haywood Farie was born; followed by a son Gilbert John Farie on 26th May 1881. 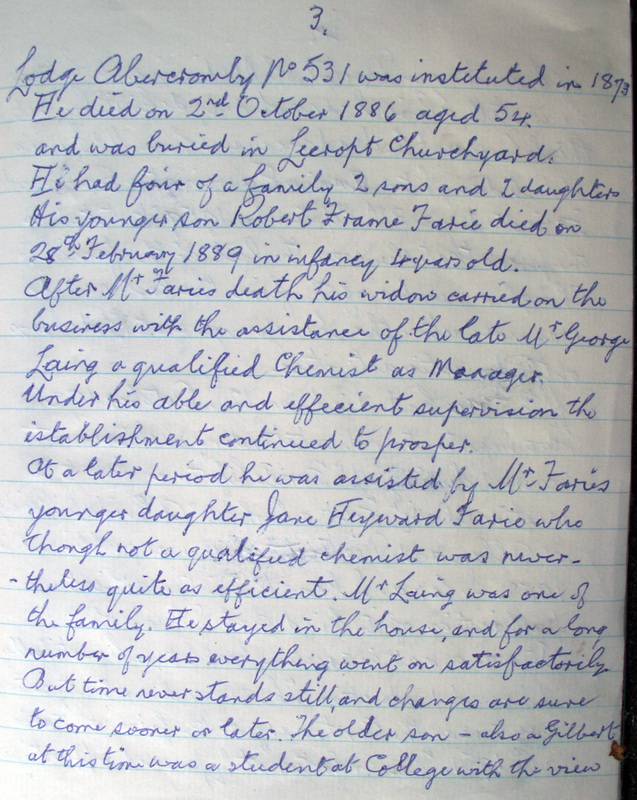 On 29th May 1883 a second daughter Jane Haywood Farie was born and she was followed by the last child to be born to the family, Robert Frame Farie, born on 26th December 1884. If this were a real fairy story the scene now would seem to be ideal, a perfect Victorian family living in respectable comfort in Bridge of Allan. But visitor numbers attending the Spa were dropping and indeed in June 1884 Gilbert Farie was placed on a Committee to consider a new Guide Book to Bridge of Allan, in order to reverse the trend. He was still advertising Houses to Let. By March 1886 the situation had become so serious for him that he appeared at the Edinburgh Bankruptcy Court and was declared bankrupt. 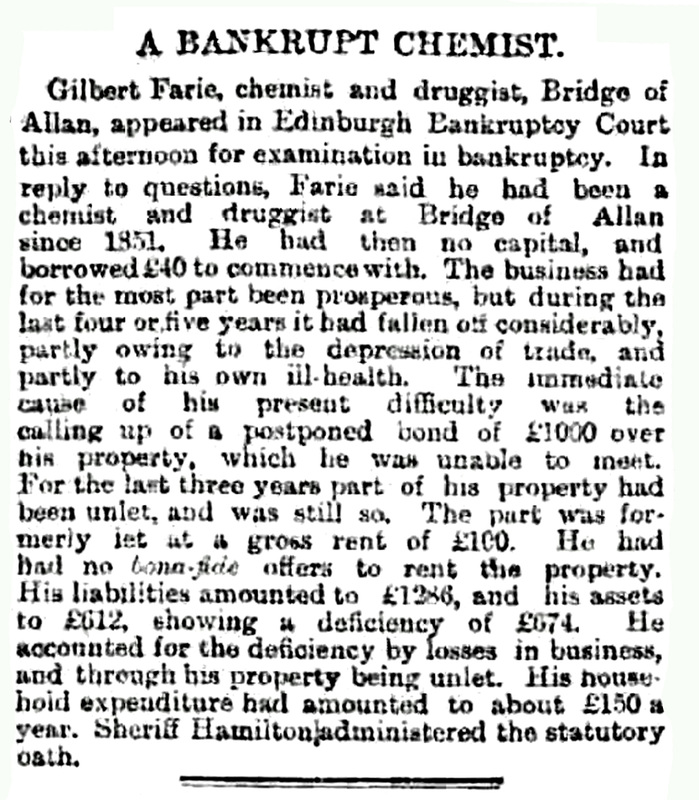 On the 17th April 1886 he advertised in the Bridge of Allan Reporter a change of name for his business to Gilbert Farie & Co. However the toll of these matters must has been considerable upon his health because on 2nd October of that year he died , the cause of death given as meningitis. A considerable obituary was published in the Bridge of Allan Gazette. Mr Gilbert Farie, chemist and druggist, died at his residence Strathallan Villa, last Saturday evening at the age of 54. His remains, in accordance with his own previously expressed desire, were interred in Lecropt burying ground on Wednesday. No funeral intimations were issued, yet notwithstanding a most representative company, including several from a distance, paid their last tribute of respect to the deceased. All the shops on the line of the route to the churchyard were closed. The deceased was very widely known and respected. Having studied at the University of Glasgow and assisted the late Dr Penny in the Andersonian Institute, he was appointed apothecary to the Glasgow Royal Infirmary, in which institution he obtained an insight (which he was not slow to take advantage of) into the treatment of various forms of ailments, which proved of great service to himself and benefit to others in later years. He came to the Bridge some 35 years ago as assistant to Mr Charles Neil Rutherfoord, at that time the only apothecary in the village, and whose shop occupied the same site as that presently occupied by Mr Oswald Robertson, chemist. 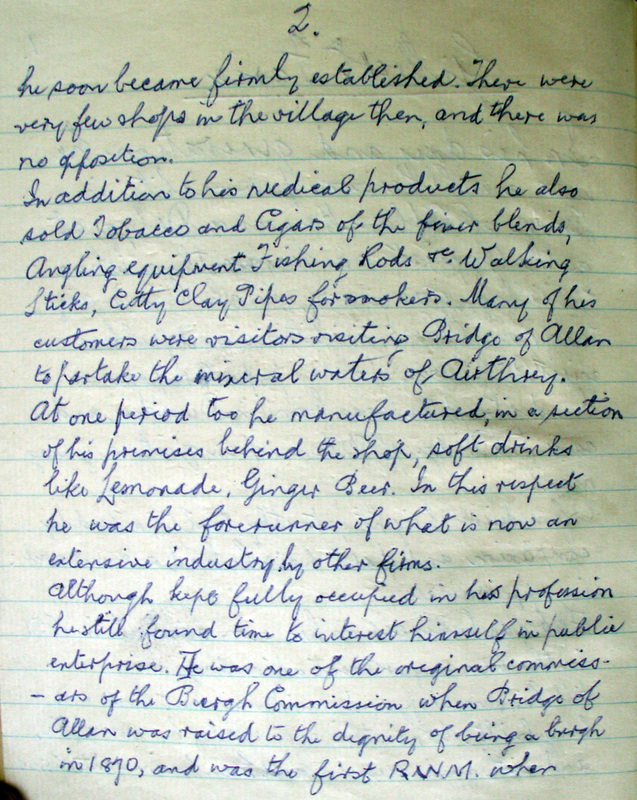 He commenced business on his own account in the shop presently occupied b Keith and Ralston, ultimately building the property in which the handsome shop is situated which he occupied at the time of his death. As a public man, his services previous to the adoption of the Police Act were invaluable to the village, of which it may be said he was a native. He did his share of work as a member of the Commission, held the Offices of Master of St John’s Lodge, and trustee of the Established Kirk of which he was a member. He published a book entitled “Farie’s Guide to Bridge of Allan”. Many can never fail to remember the timeous kindnesses rendered by the deceased. He was ever ready, in season and out of season, to succour and to aid in various ways the distressed. Many in the absence of medical assistance has he been the means of relieving, and during the long and weary hours of night often was he the attendant on the suffering and the dying. His midnight vigils, soothing and solacing the afflicted, tended in no small degree, we fear, to break down at a premature age a constitution never robust. He will be missed. He leaves a widow and four young children to mourn his loss, and for whom much sympathy is expressed. Rev John Reid officiated at the house, while the solemn and impressive service conducted by Rev P W Young at the grave was much appreciated by the mourners. We understand that Mrs Farie, with the aid of a confidential and thoroughly qualified assistant, will continue to carry on the business. This left his widow with children of 7yrs, 5yrs, 3yrs, and not quite 2yrs of age. She now found herself with a pharmacy business and declining business interests, and a young family to raise. 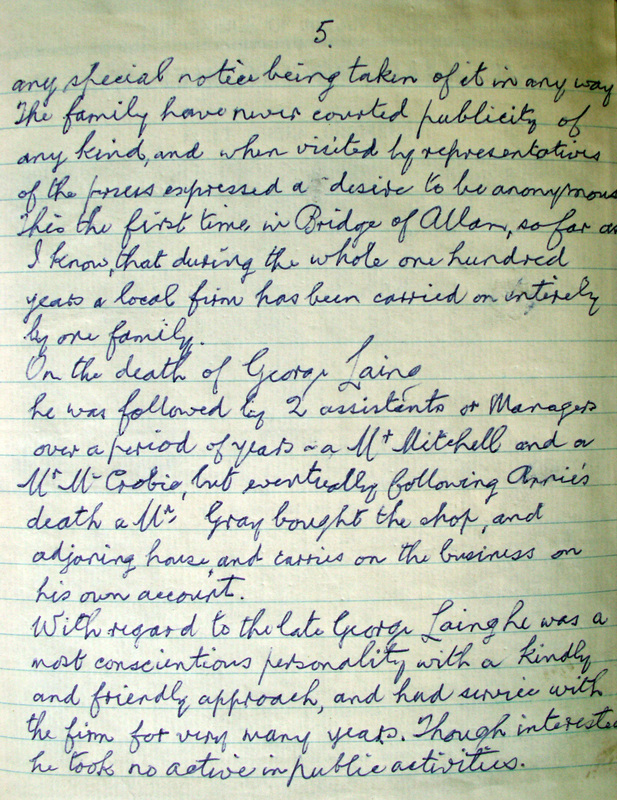 The pharmacist who reported Gilbert’s death to the Registrar continued to work for many years in the family’s employment, and Mr George Laing must have been a terrific support to them. 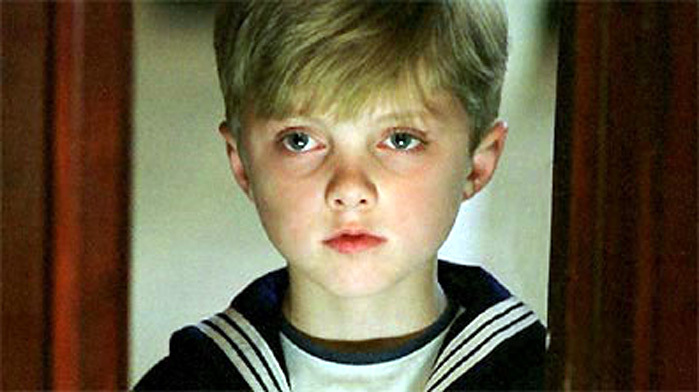 The youngest child Robert within 3 years joined his father in Lecropt Churchyard, his death due to laryngitis. Whereas in Gilbert’s day his activities in the community were well documented in the local press after his death the family lead a private life and only rarely was any mention made of them. In 1902 whilst his son Gilbert Farie was a medical student at Edinburgh University he distinguished himself by become medallist in two areas of study, Diseases of the Eye and Diseases of Tropical Climates. Prior to the outbreak of the First World War he was in practice in Wimbledon but then was appointed to a Temporary Commission as Lieutenant, Army Medical Corps on 1st October 1916. He was promoted Captain a year later and in March 1919 relinquished his commission, whilst retaining the rank of Captain. He was awarded the Military Cross in the Birthday Honours, June 1919. During the Great War his eldest sister Annie Farie was on the staff of the Hyndwood Auxiliary Hospital, Bridge of Allan which cared for wounded soldiers. She also organised Flag days on behalf of a number of charities assisting in the war effort and the not inconsiderable sums raised are detailed in John J McKay’s book “Bridge of Allan’s Activities in the Great War”. Her younger sister however had gone into the family business and although she never had a formal pharmaceutical education many believed that she was a qualified chemist. She worked alongside a number of pharmacist managers and support staff. 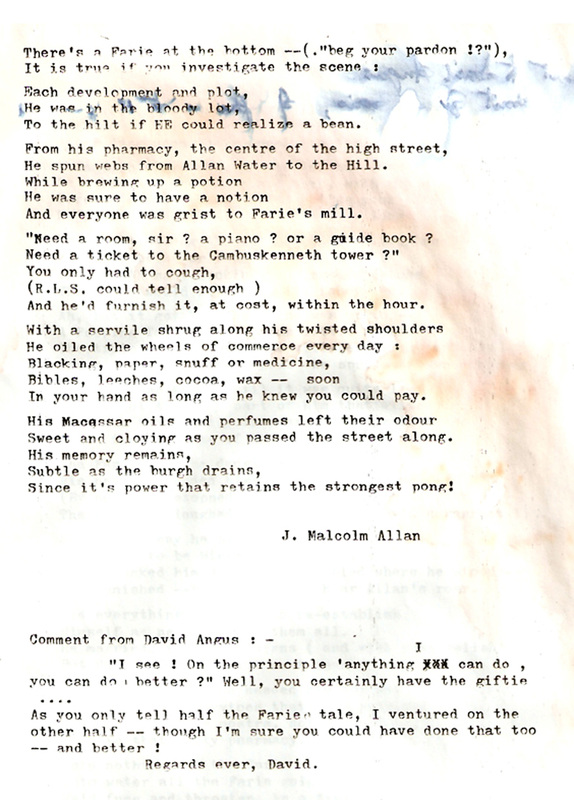 There are still a number of Bridge of Allan male residents who were employed as message boys by Farie & Co. Earlier in the century however and prior to the Great War it was obviously the custom of errand boys to inscribe their name in pencil on the hidden sides and backs of wooden drawers in the dispensary. The names George Abercromby, William Watson, James McAlpine, Robert McKenzie, Charles McKay, are all scrawled on the wooden drawers, together with the name Laurence Allan, Allanbank and the date 1/12/1913. You can find that same name inscribed elsewhere in Bridge of Allan on the Memorial to the Fallen of the Great War in the Pullar Park. Jeanie Farie has her name inscribed in Bridge of Allan’s history in her success in a golf competition in Bridge of Allan in 1908. I have the silver trinket box which she won here tonight. She continued to play her part in village life through the Second World War and then in 1947 she employed a new pharmacist who in the 1950’s went into partnership with her and her sister, Annie. That gentleman was my father and the Farie story nears its conclusion. 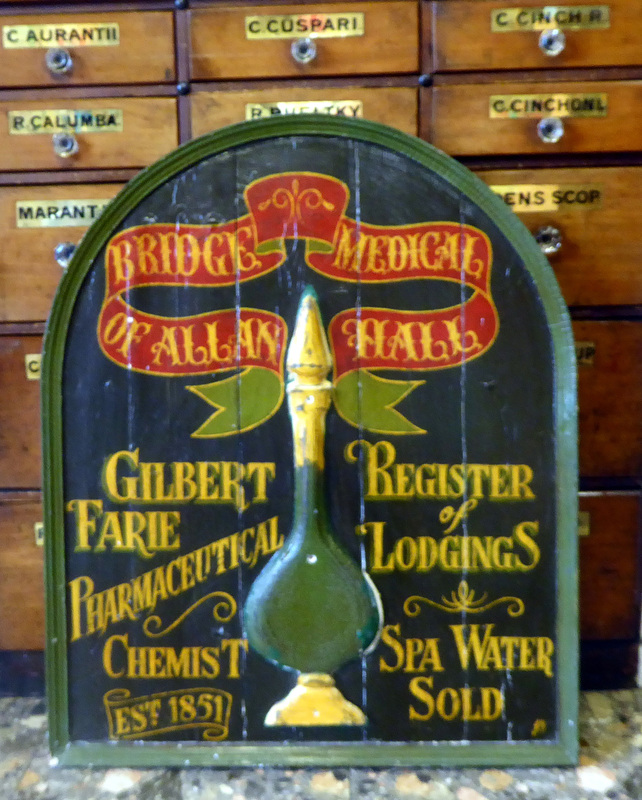 As successor to my father in Strathallan Pharmacy I often muse and wonder what the father of the business, Gilbert Farie would think if he could return today to view the enterprise which he started. Electric light and heating, the telephone, the computer, a vast array of potent pharmaceutical products, motor vehicles. In this life we own nothing, however wealthy we may consider ourselves to be, we are only tenants of what we currently possess. In consequence my family have been tenants of Strathallan Pharmacy, we have inherited the Farie story and if I were granted one wish it would be that it lives happily ever after.